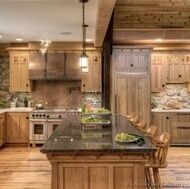 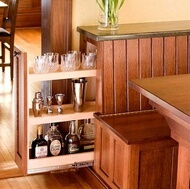 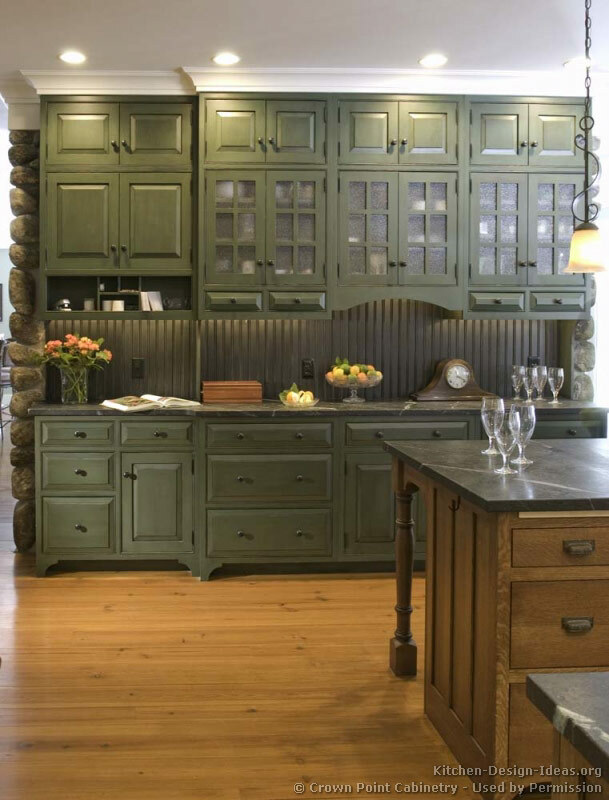 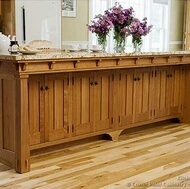 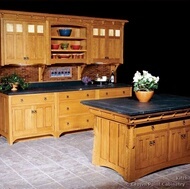 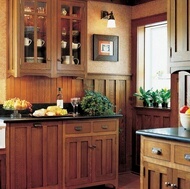 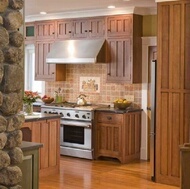 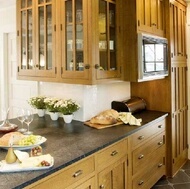 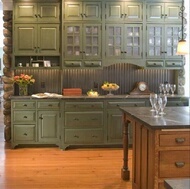 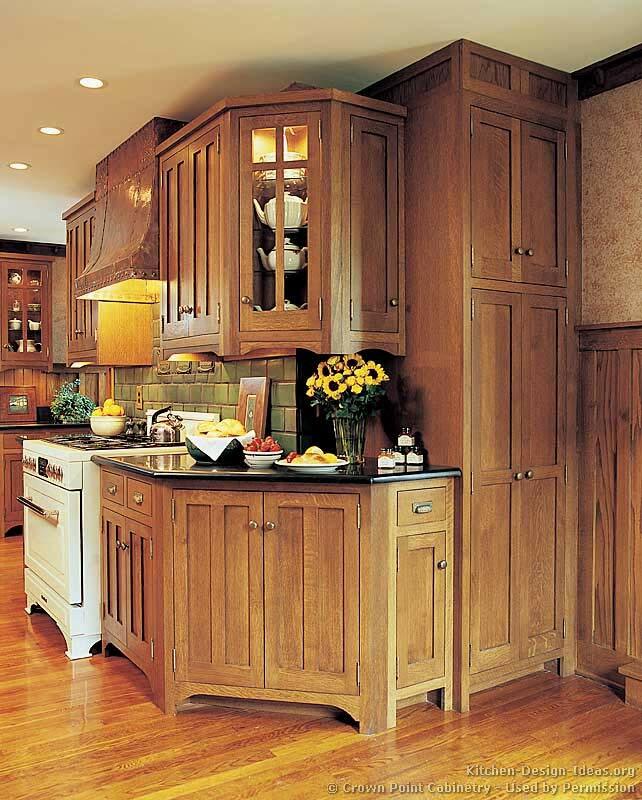 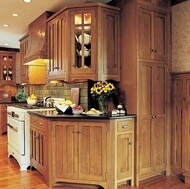 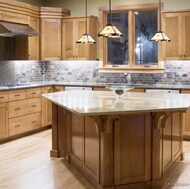 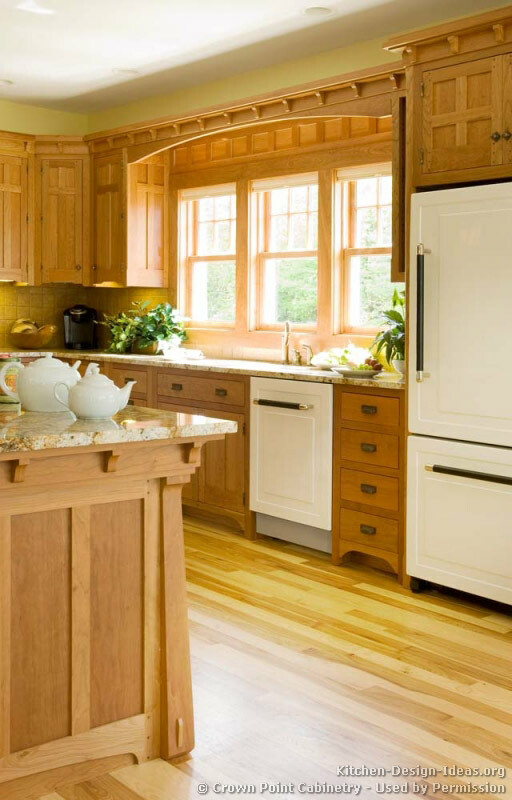 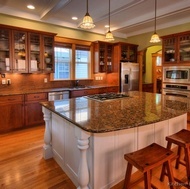 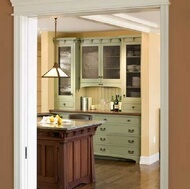 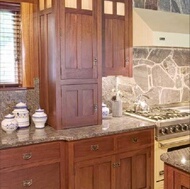 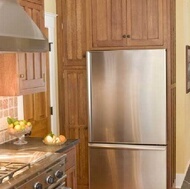 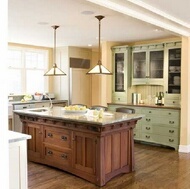 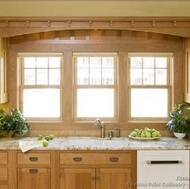 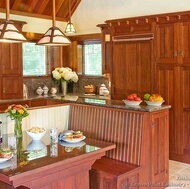 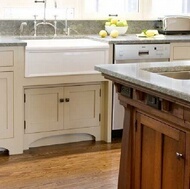 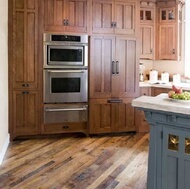 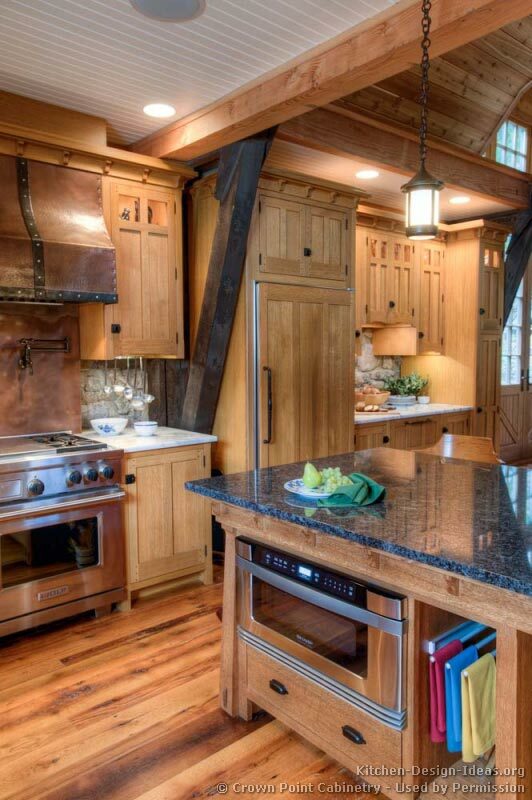 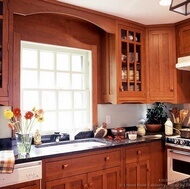 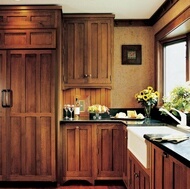 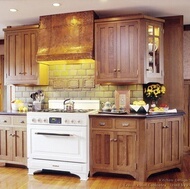 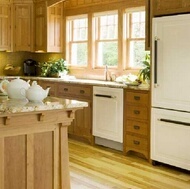 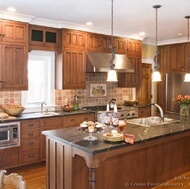 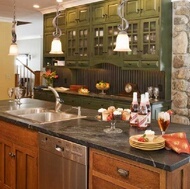 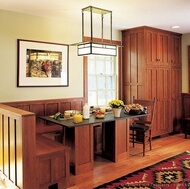 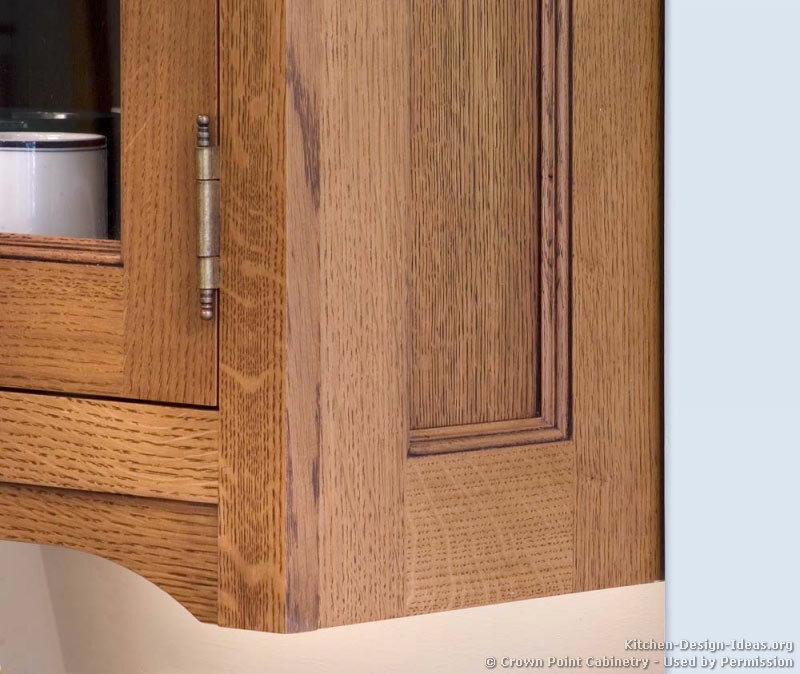 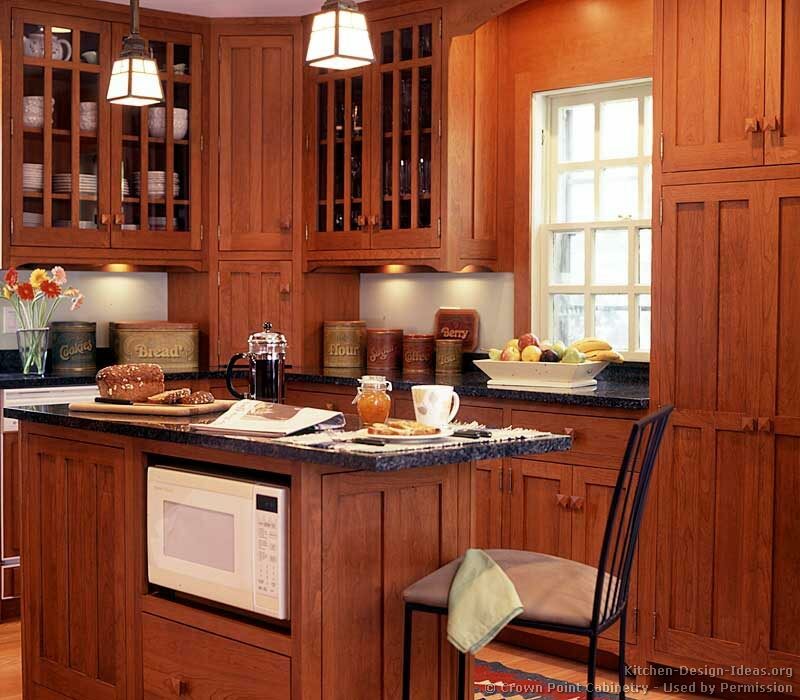 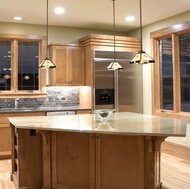 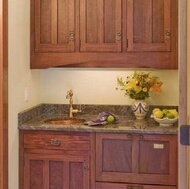 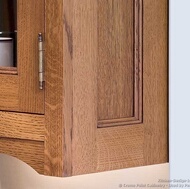 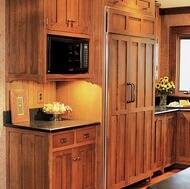 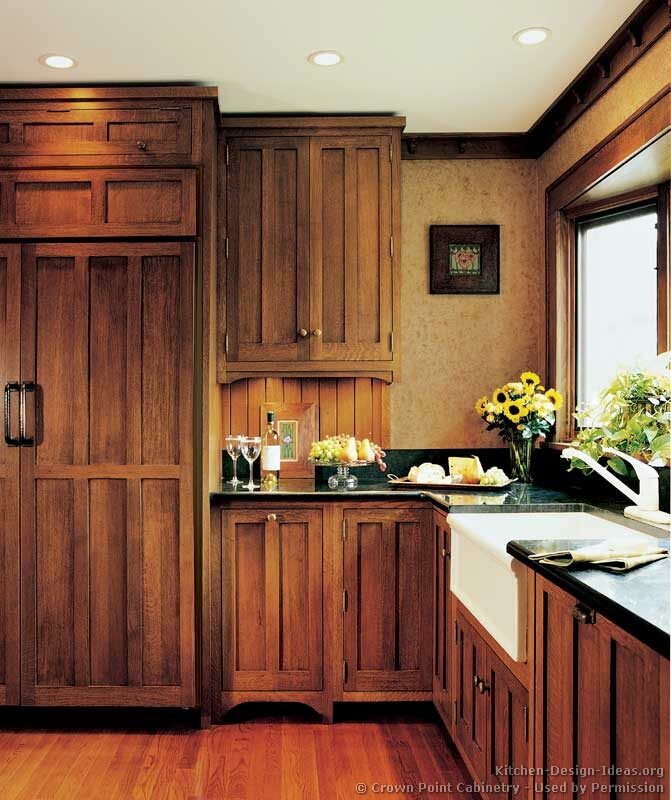 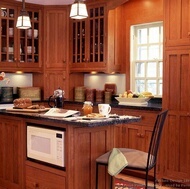 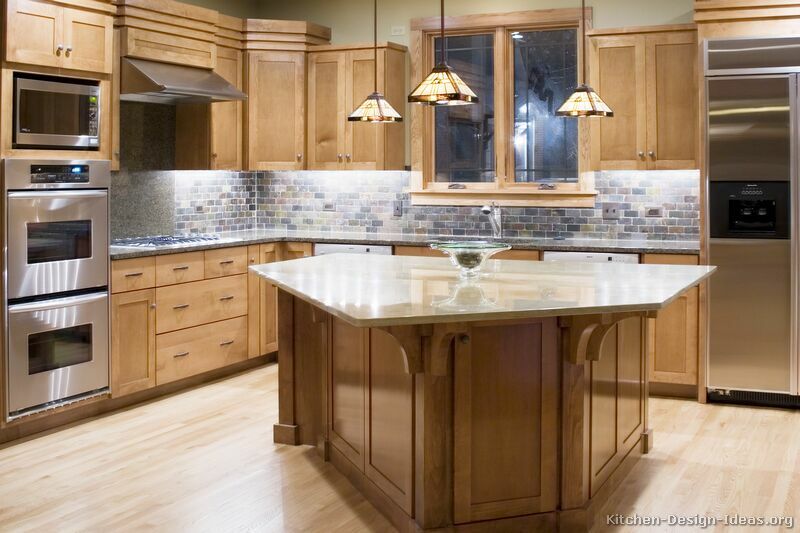 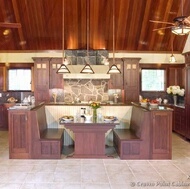 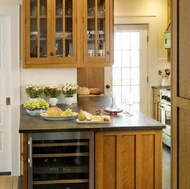 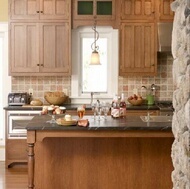 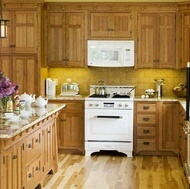 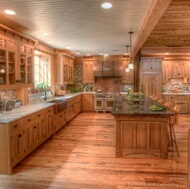 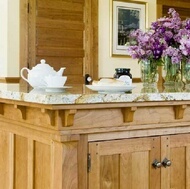 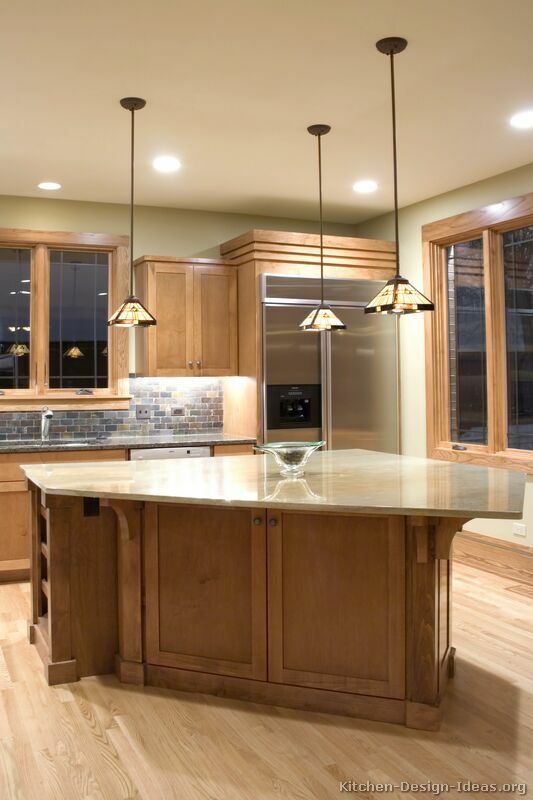 Craftsman kitchen cabinets are defined by simple lines, rugged construction, and very little excess ornamentation. 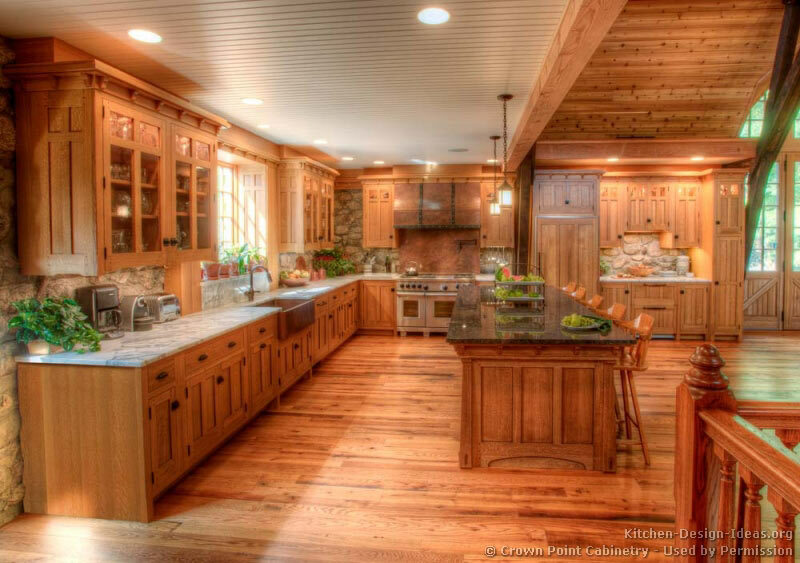 Scroll down to see the complete photo gallery below. 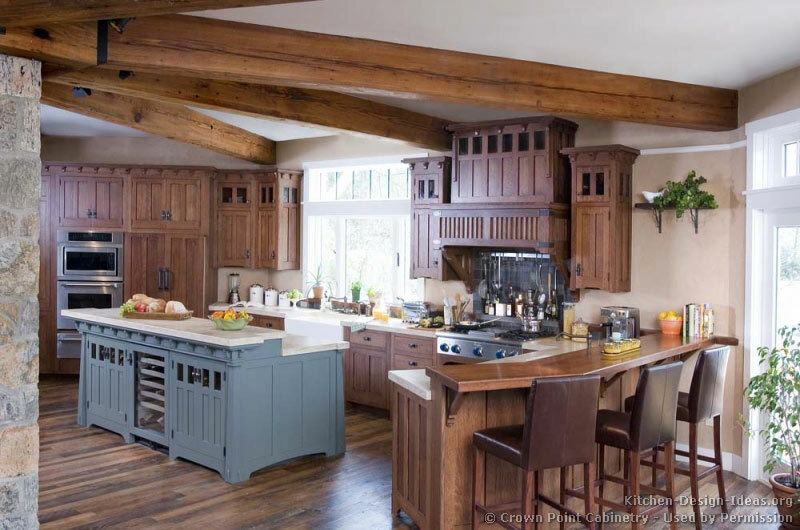 This amazing Craftsman style kitchen features beautiful woodwork, a blue furniture-style island, a decorative wood hood, a paneled refrigerator, and white marble countertops. 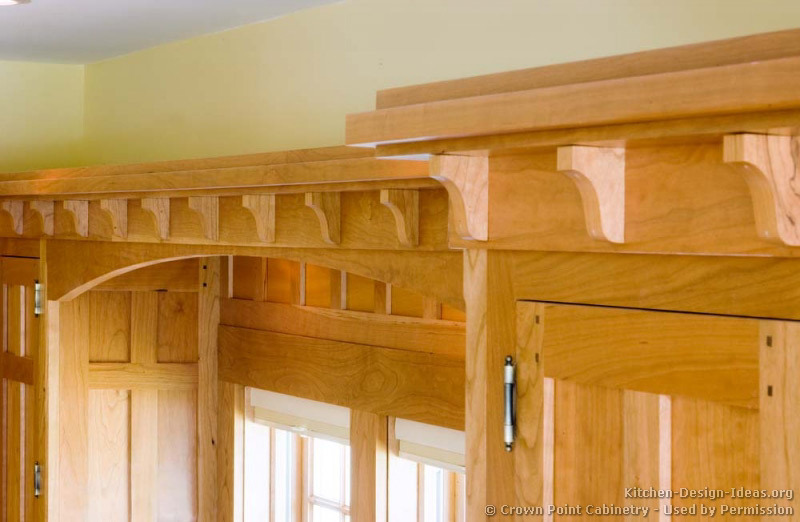 Stylistic Origins: The Craftsman style, an American extension of Britain's Arts and Crafts movement, began in the United States between 1900 and 1930. 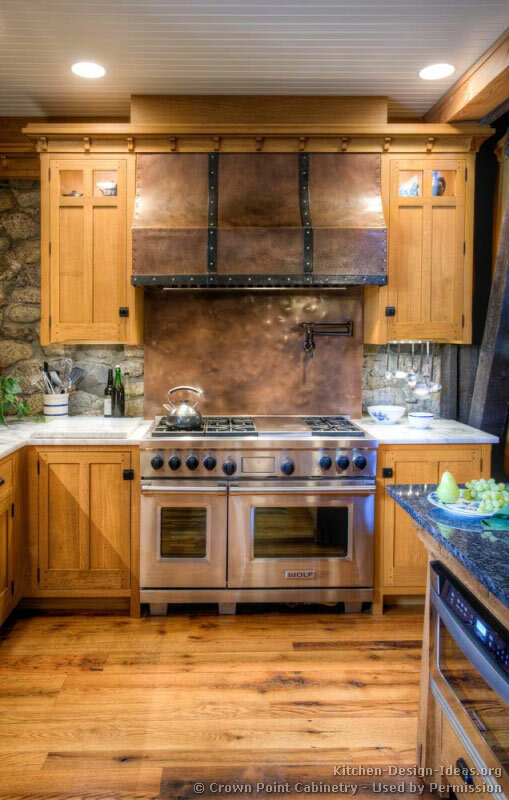 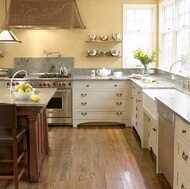 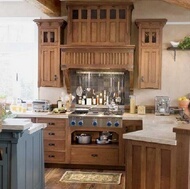 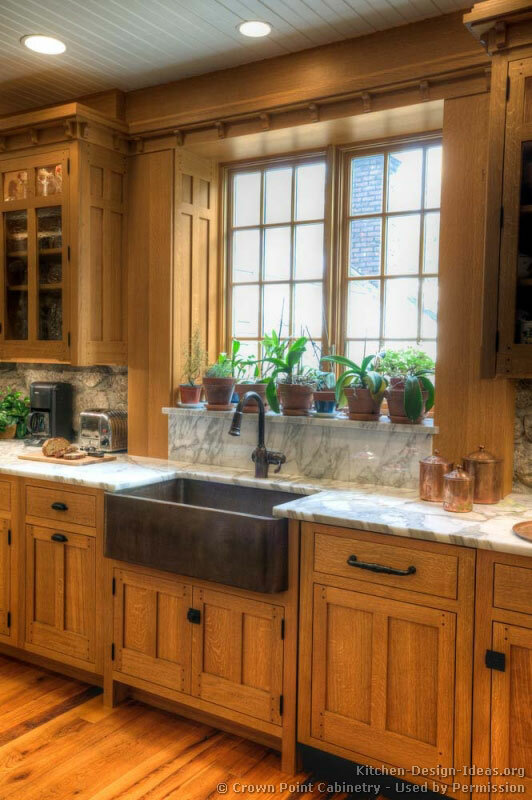 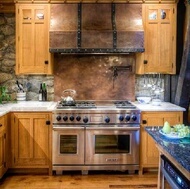 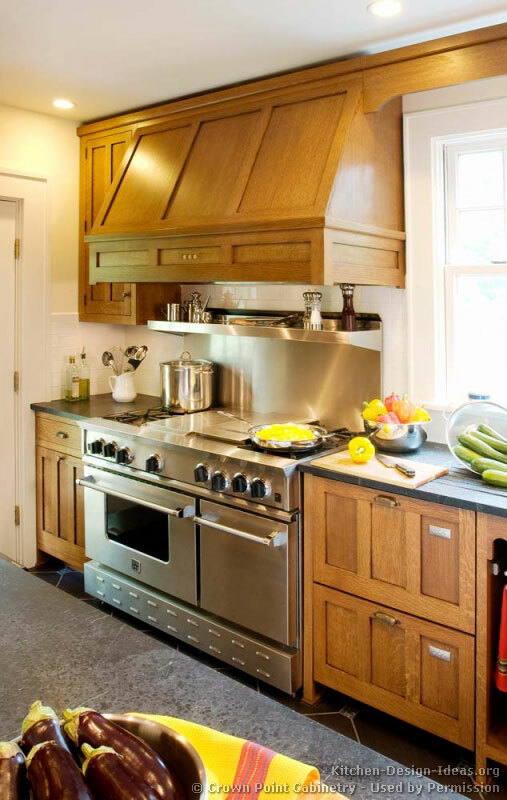 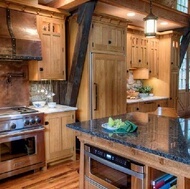 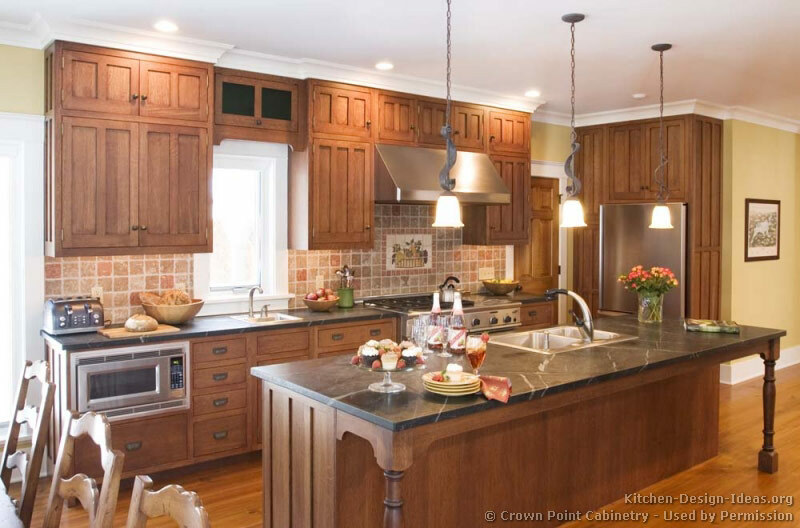 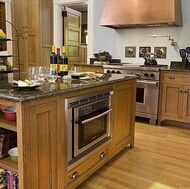 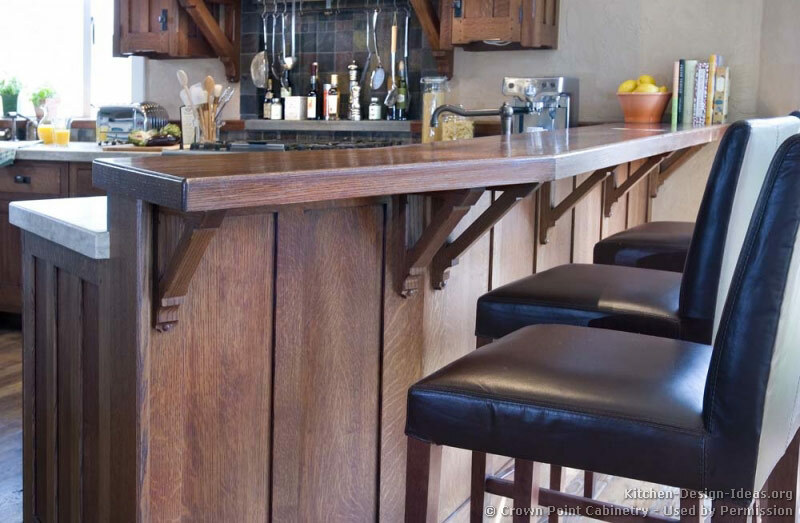 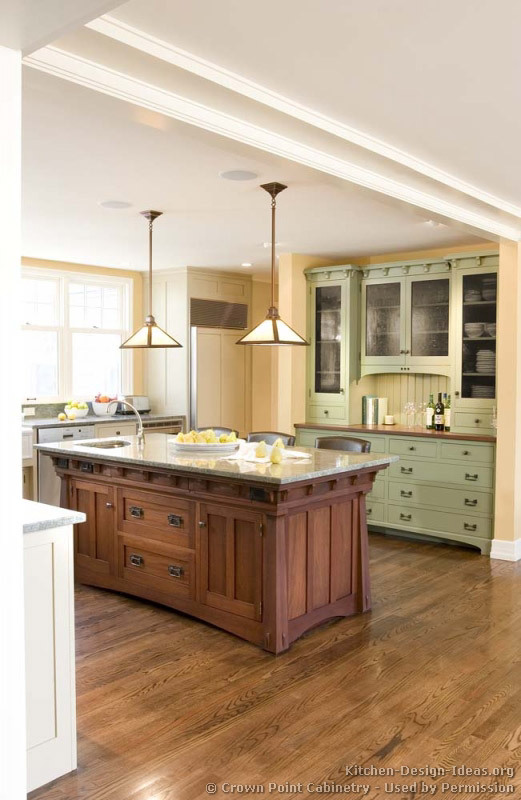 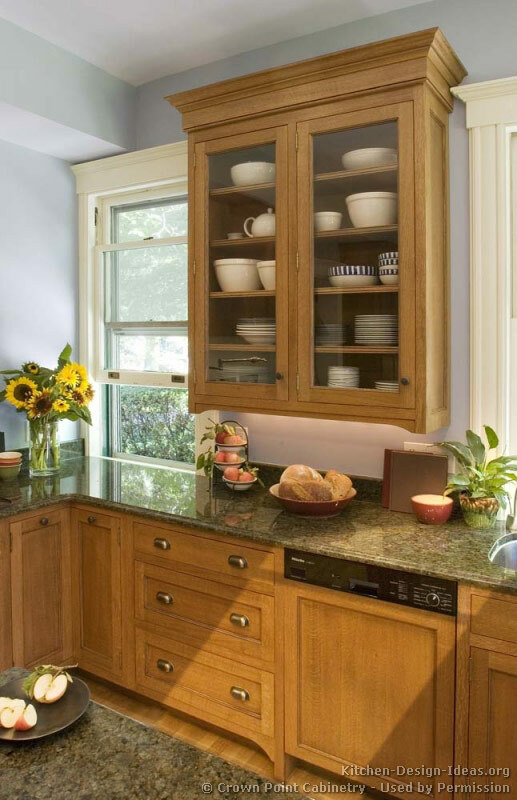 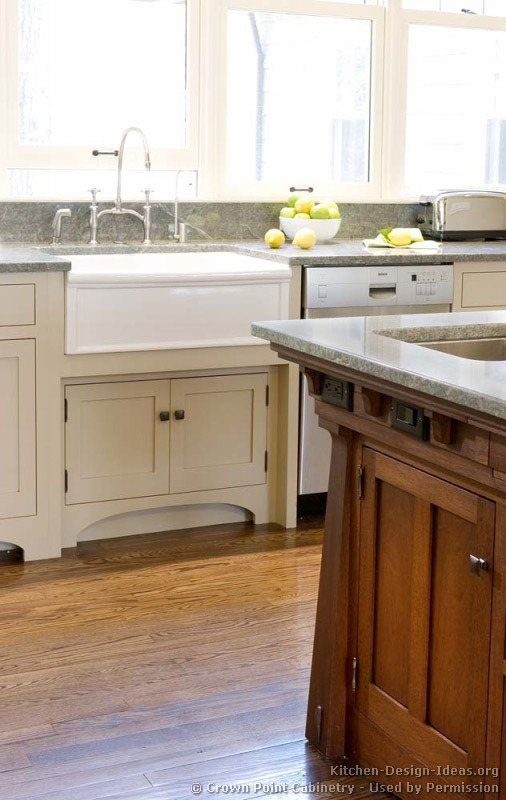 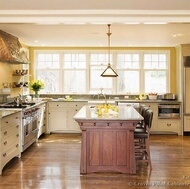 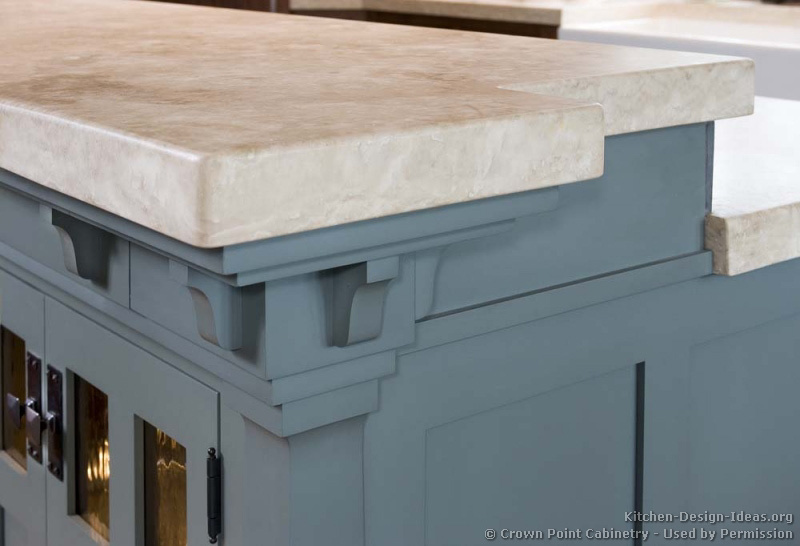 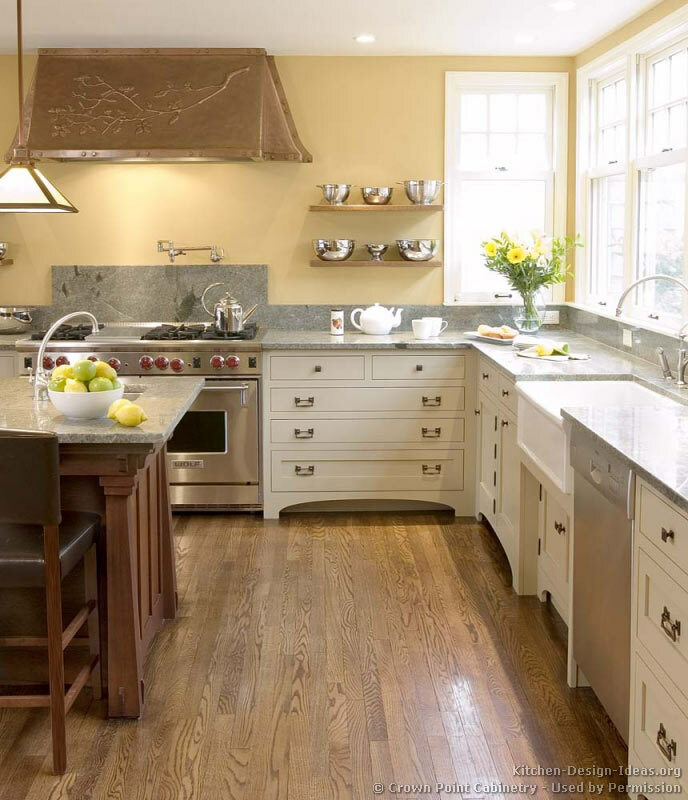 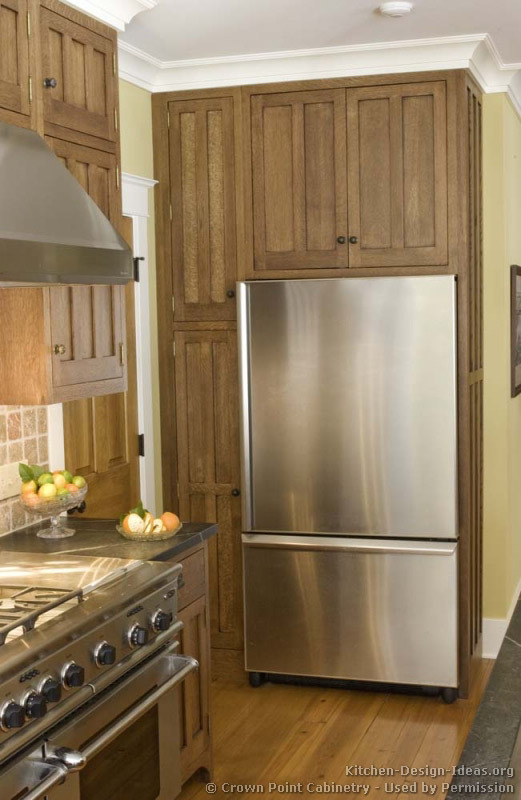 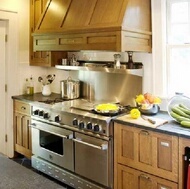 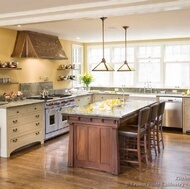 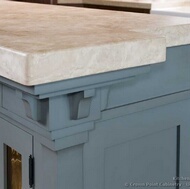 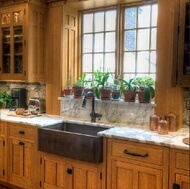 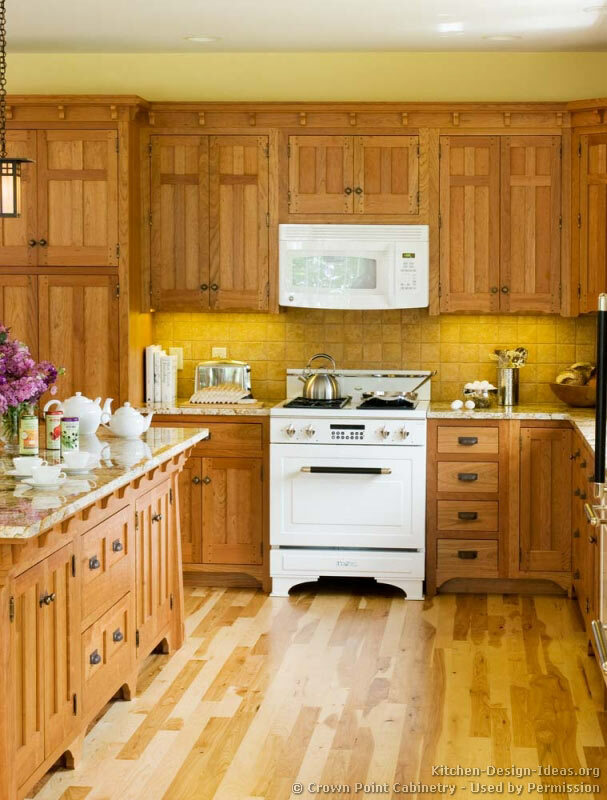 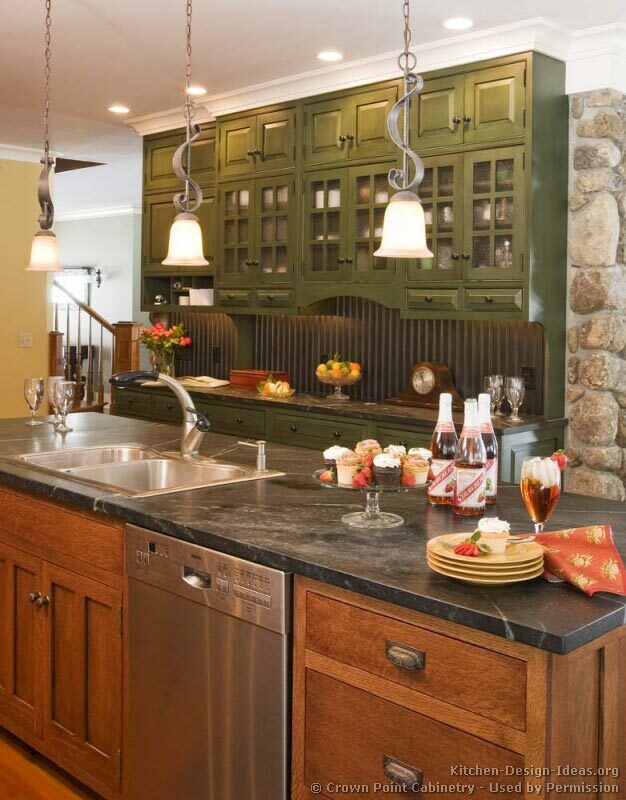 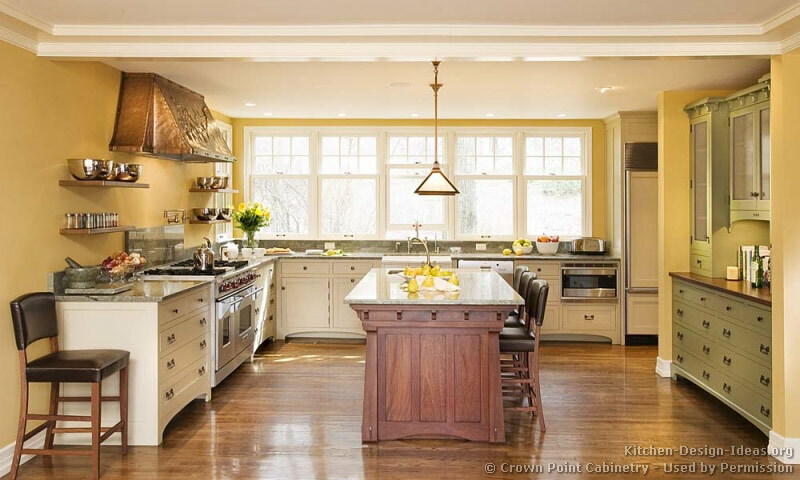 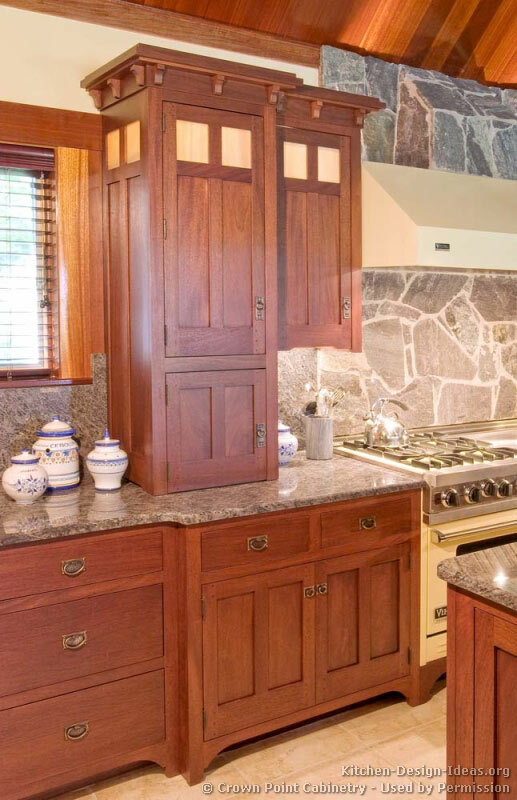 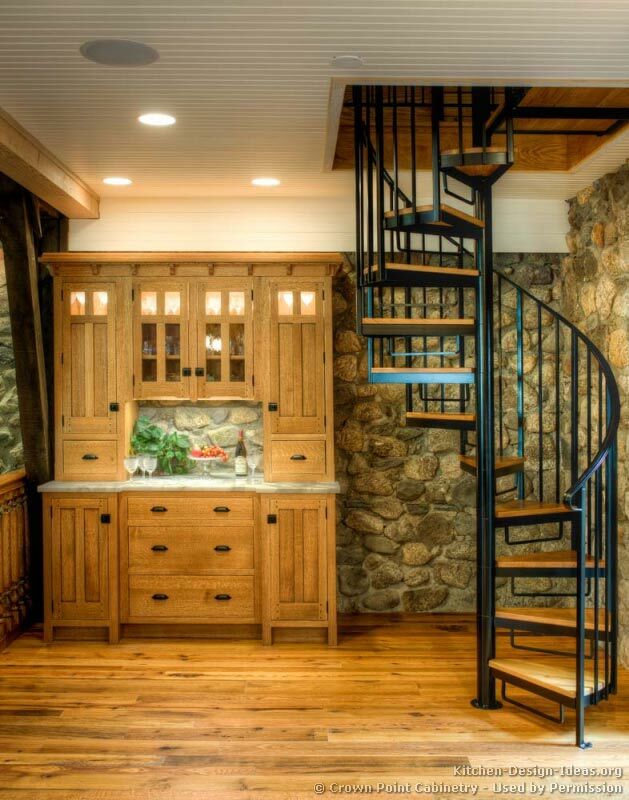 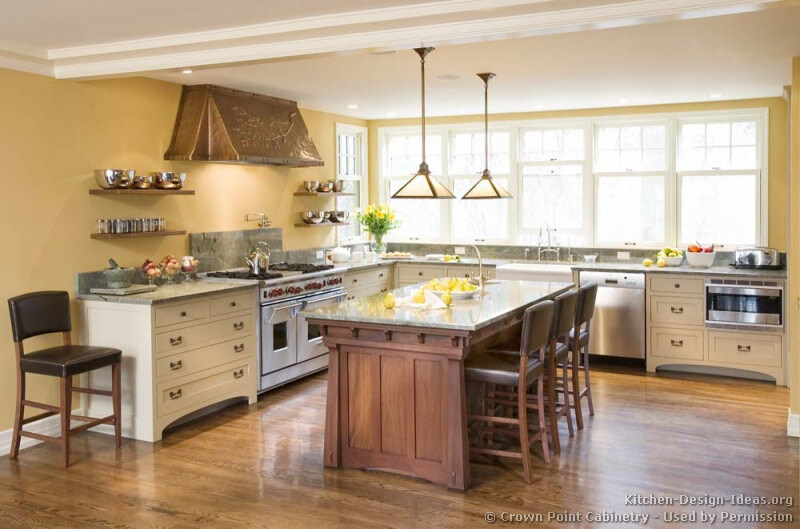 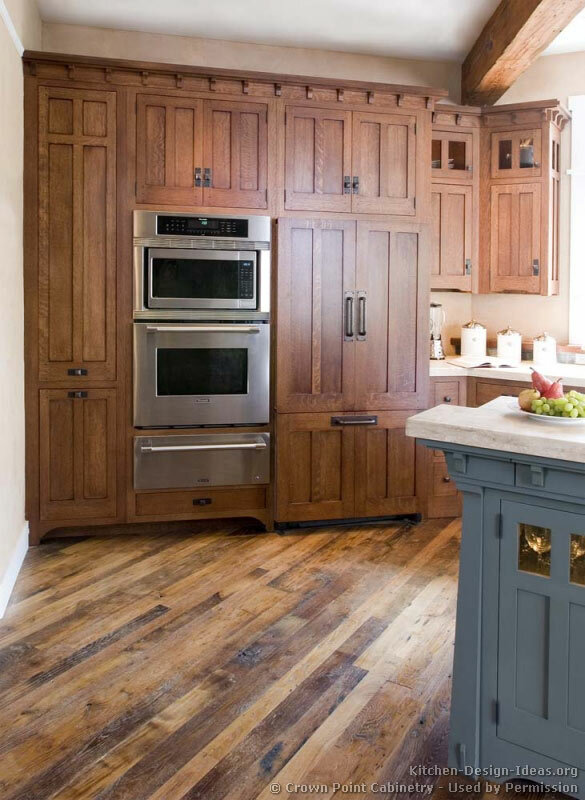 Recent revivals have reinvigorated the movement, and Craftsman style kitchens are growing in popularity today for their historic beauty, craftsmanship, and quality. 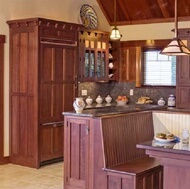 Design Features: The Craftsman style is inspired by the English Arts & Crafts style but with an American twist. 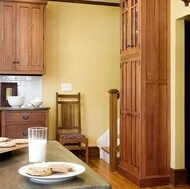 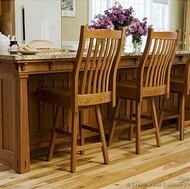 Largely developed by Gustav Stickley, Craftsman designs tend to be simple, with straight lines and "hefty" proportions. 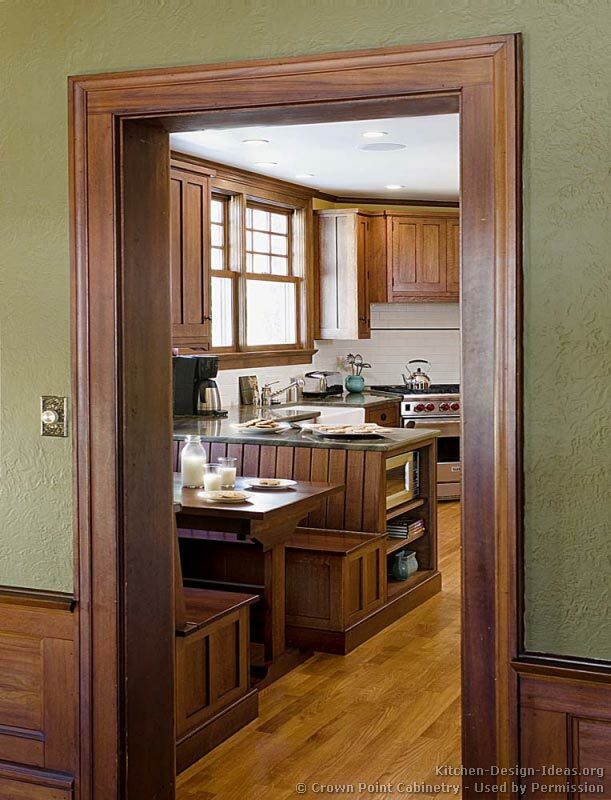 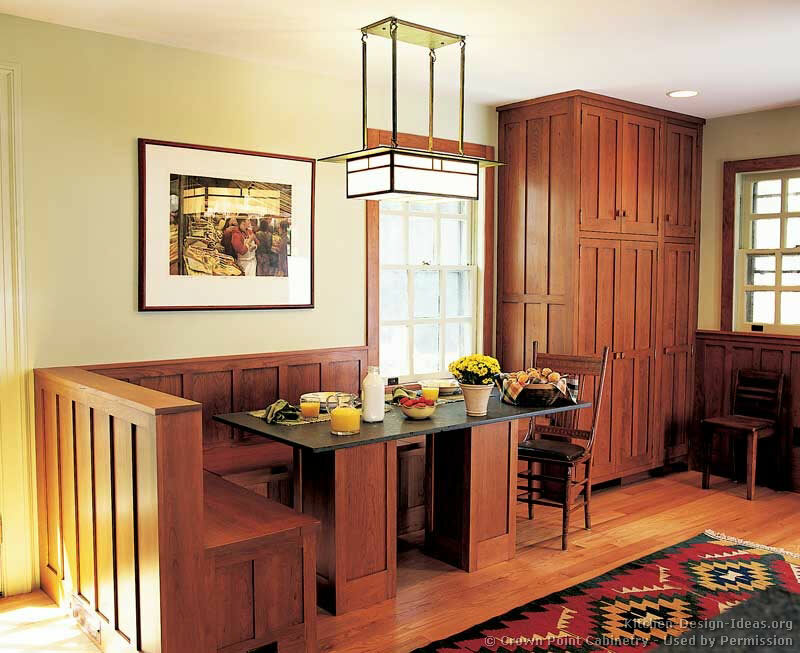 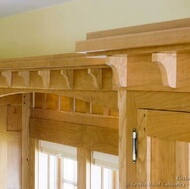 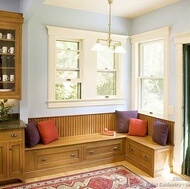 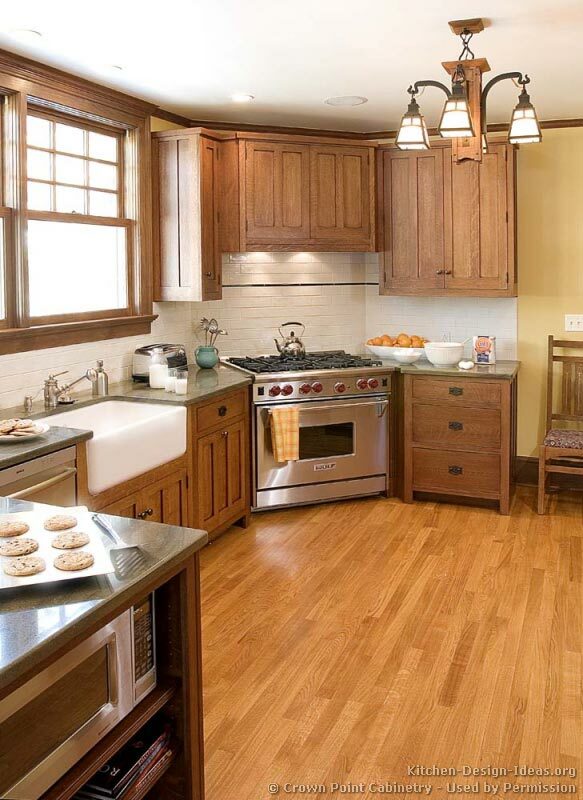 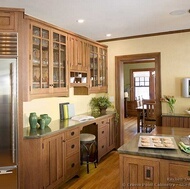 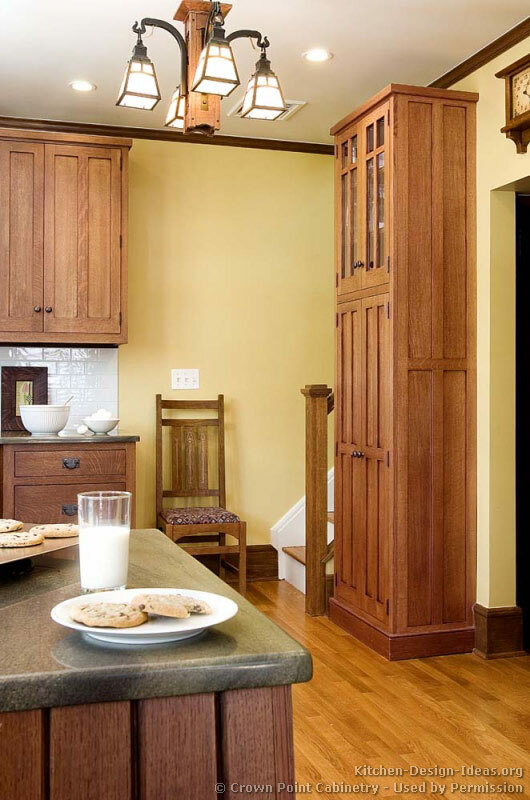 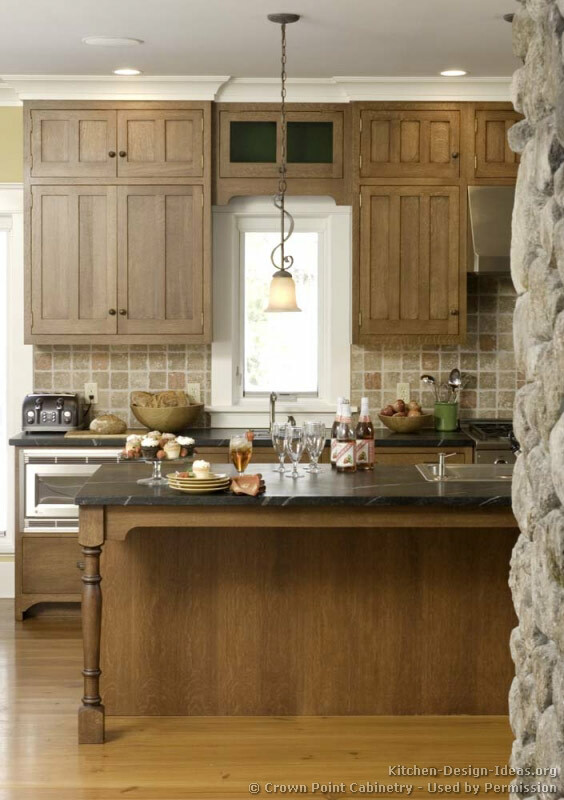 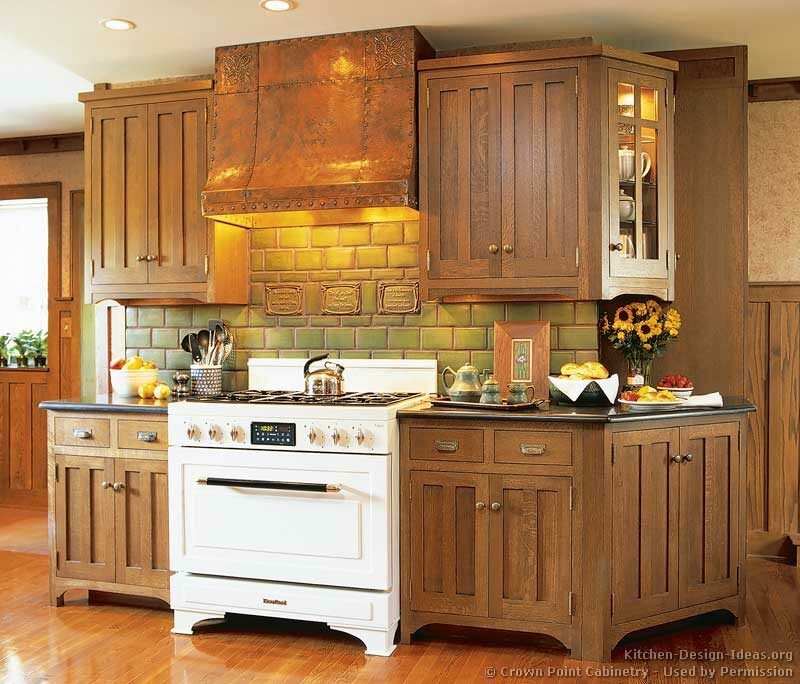 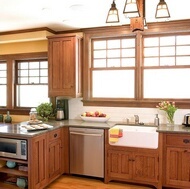 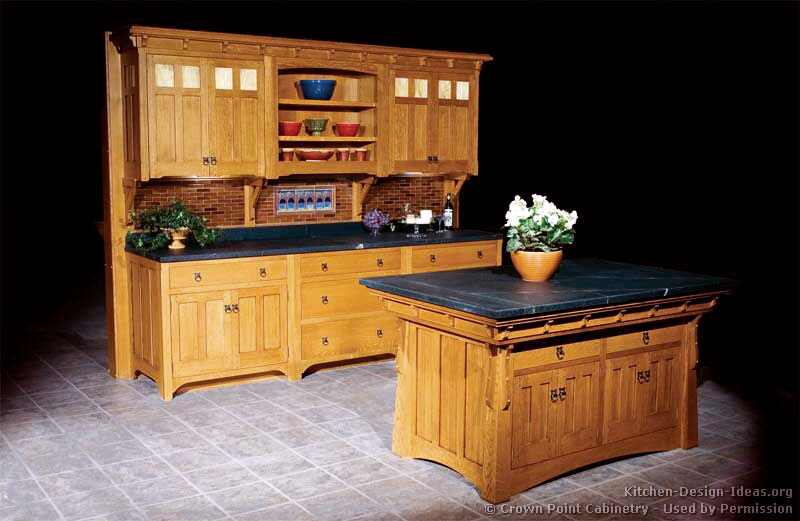 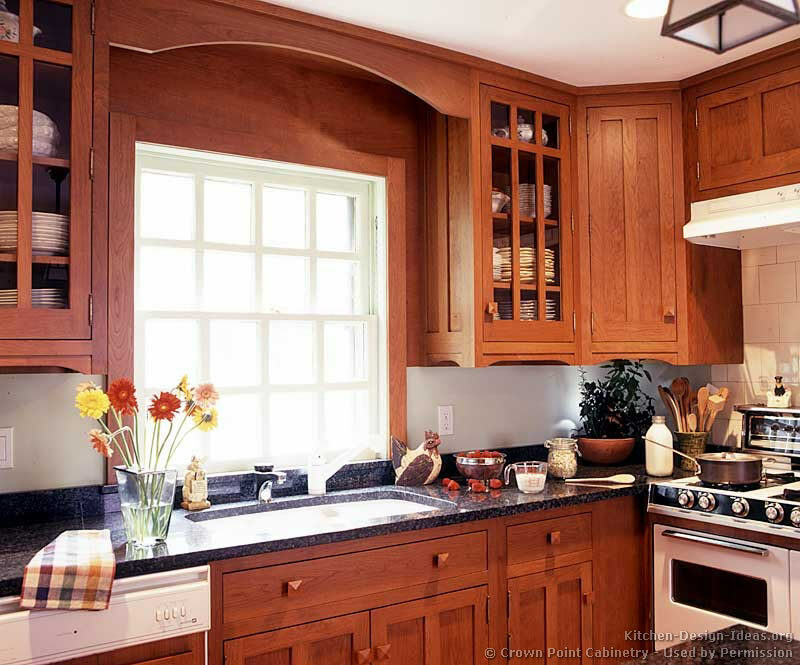 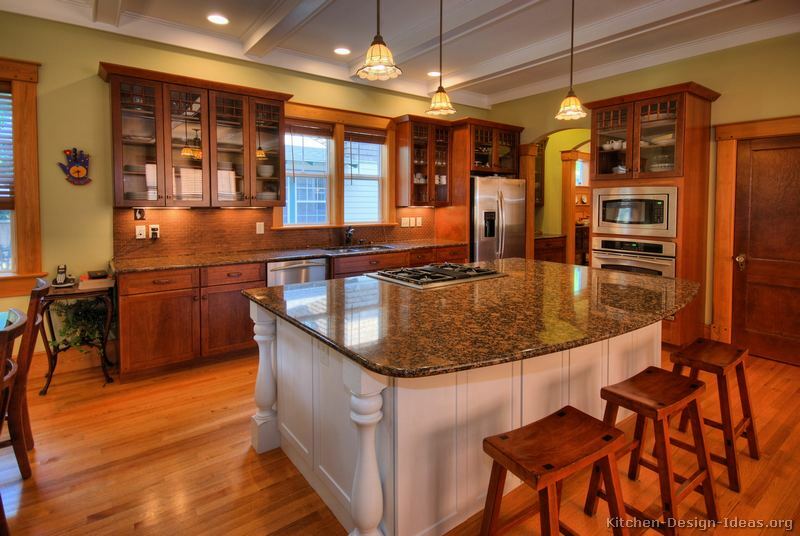 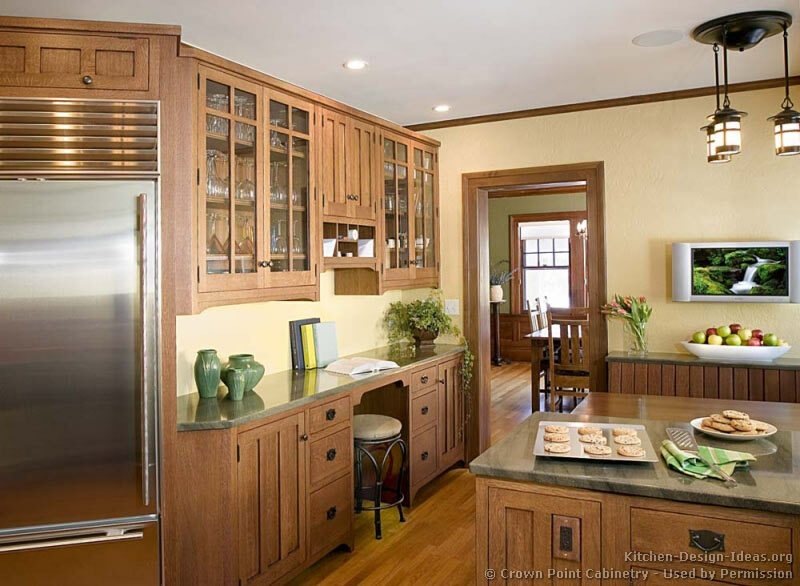 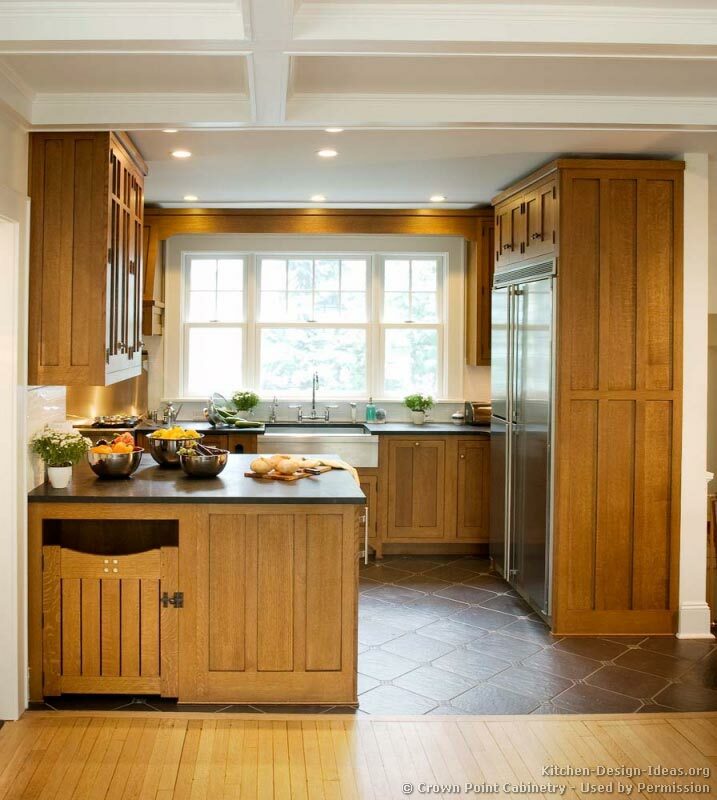 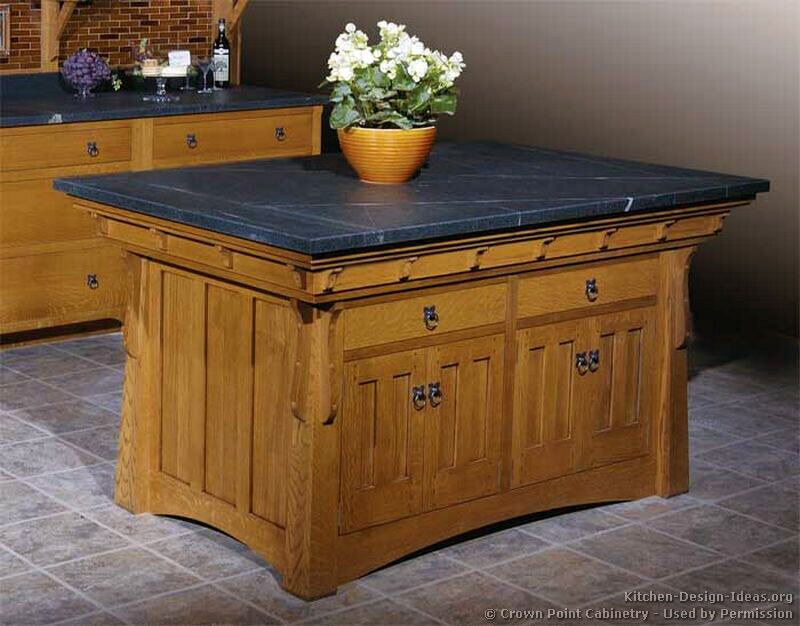 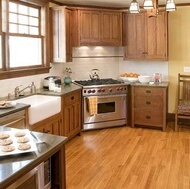 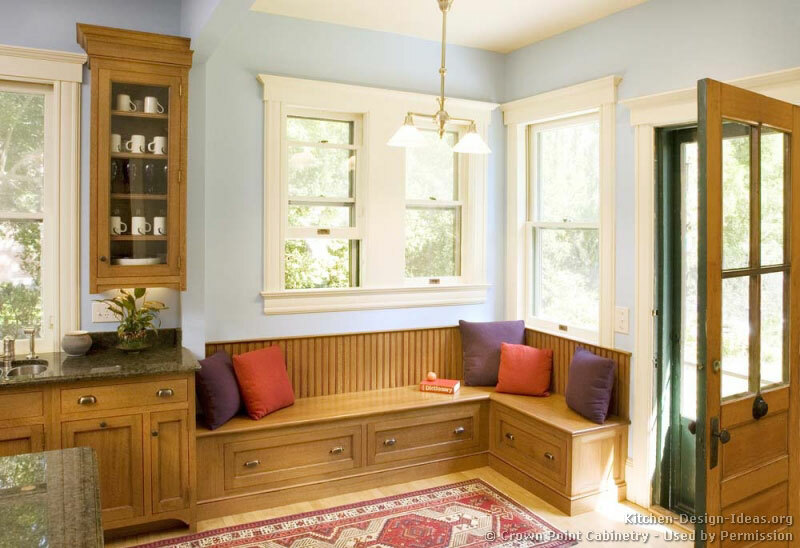 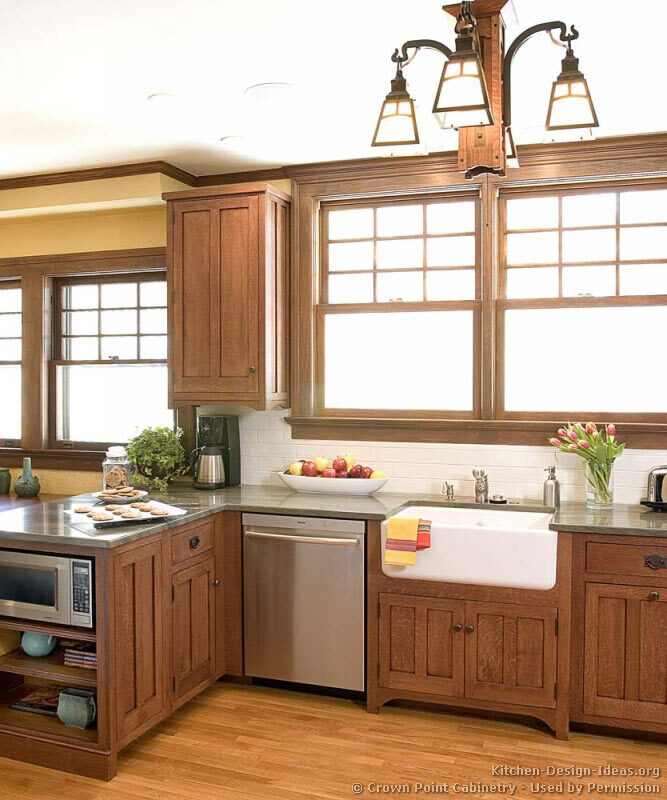 Like the Arts & Crafts style, the Craftsman style bears some resemblance to historic Shaker and Asian designs. 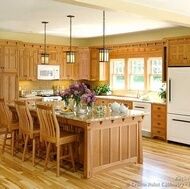 Occasionally referred to as the Mission style, the Craftsman style usually features Shaker door styles, iron or brass hardware, and Quartersawn Oak cabinets. 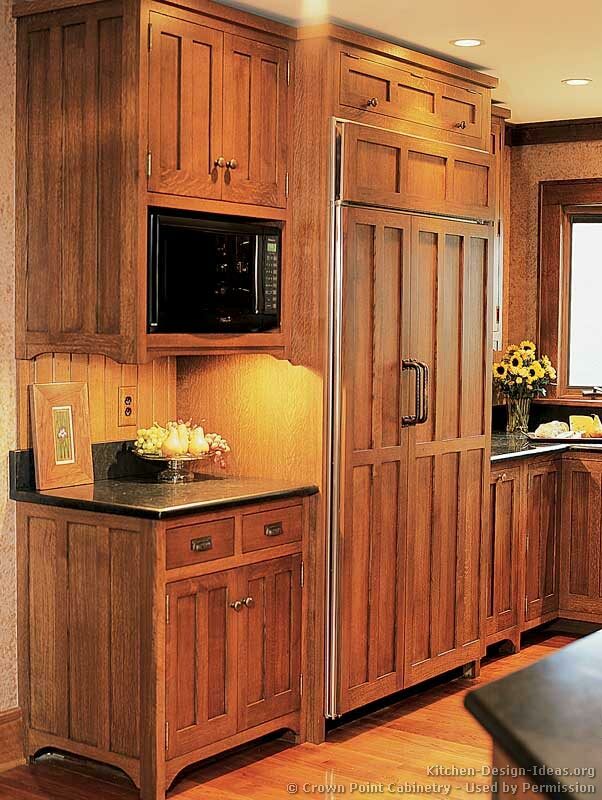 Other appropriate woods include Vertical Grain Fir, Mahogany, and Cherry. 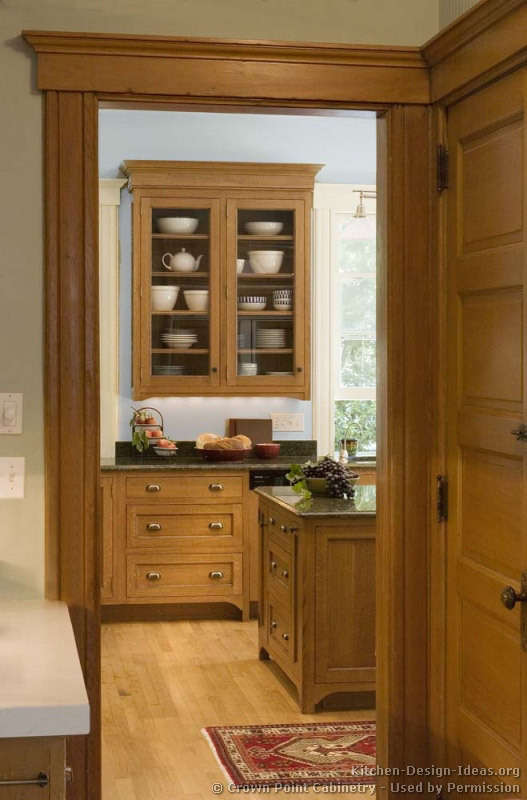 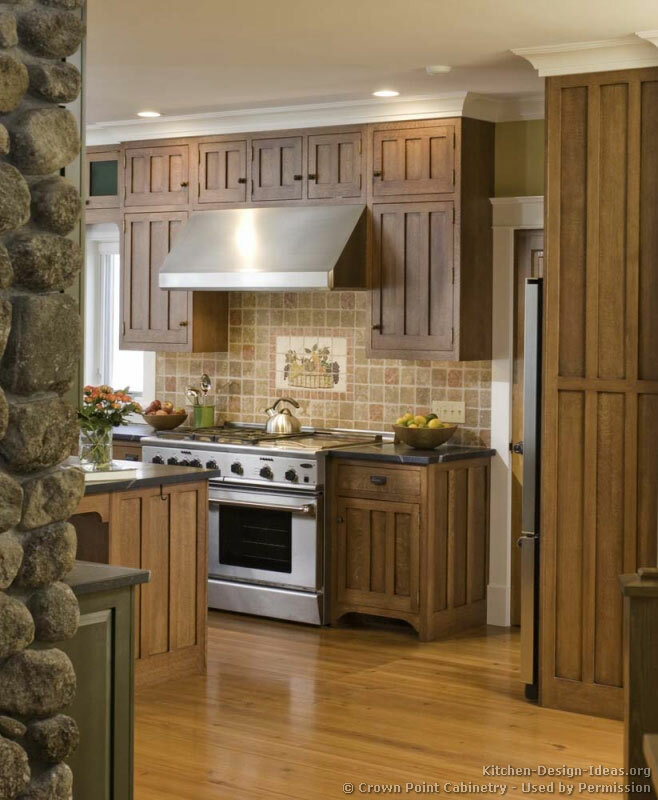 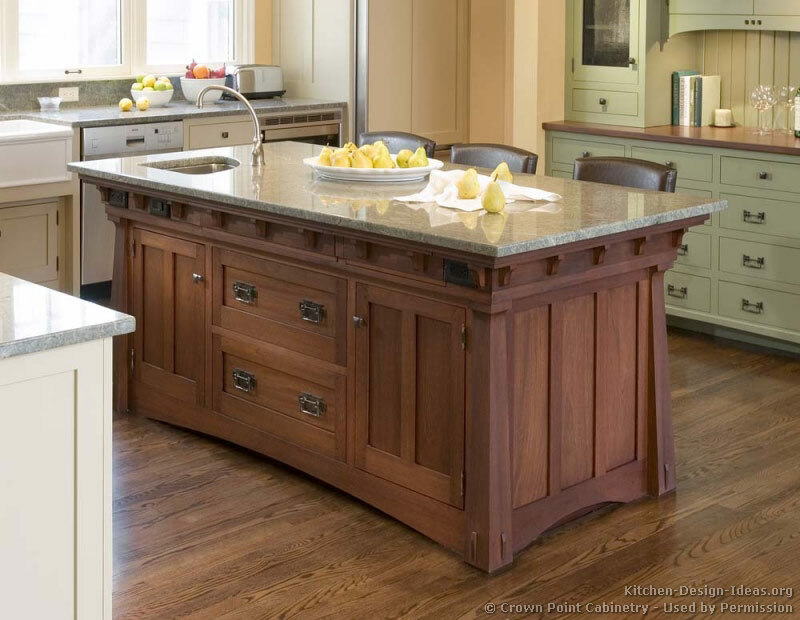 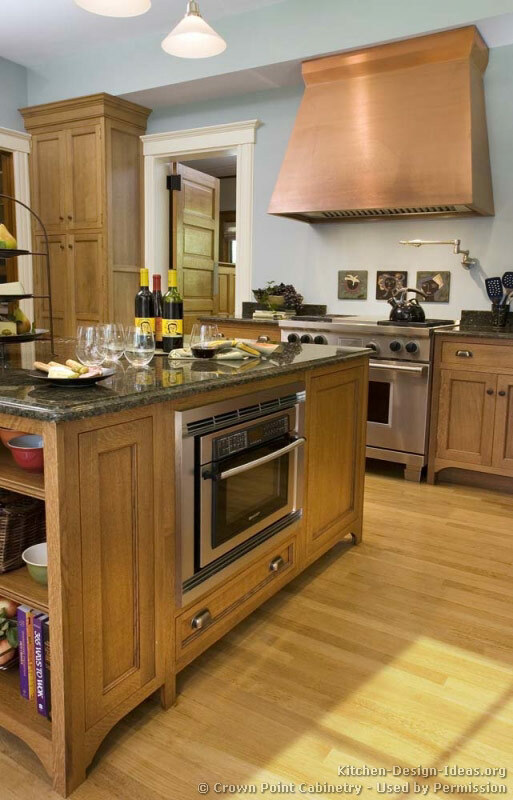 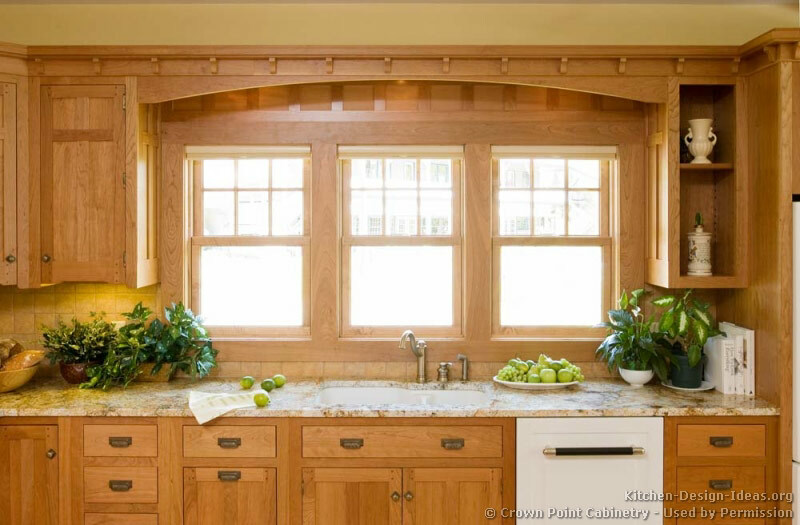 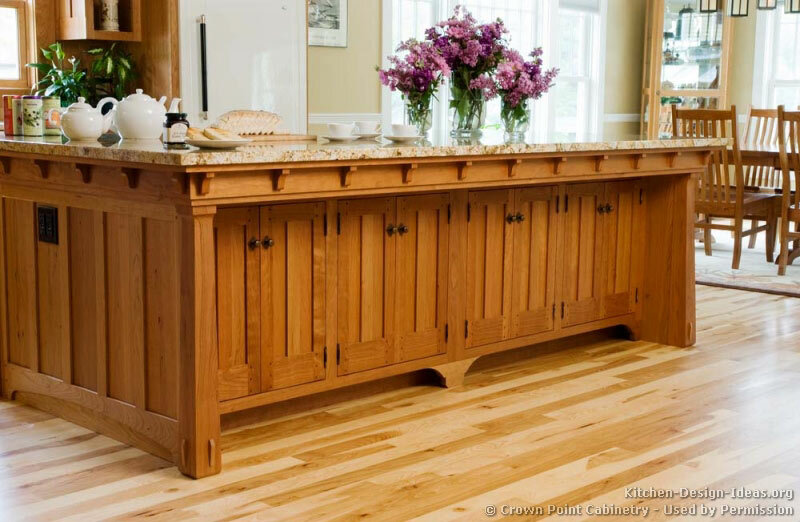 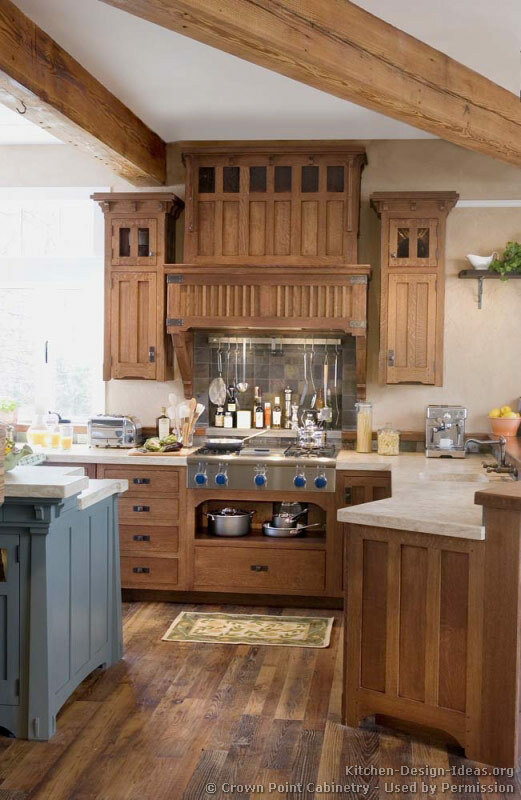 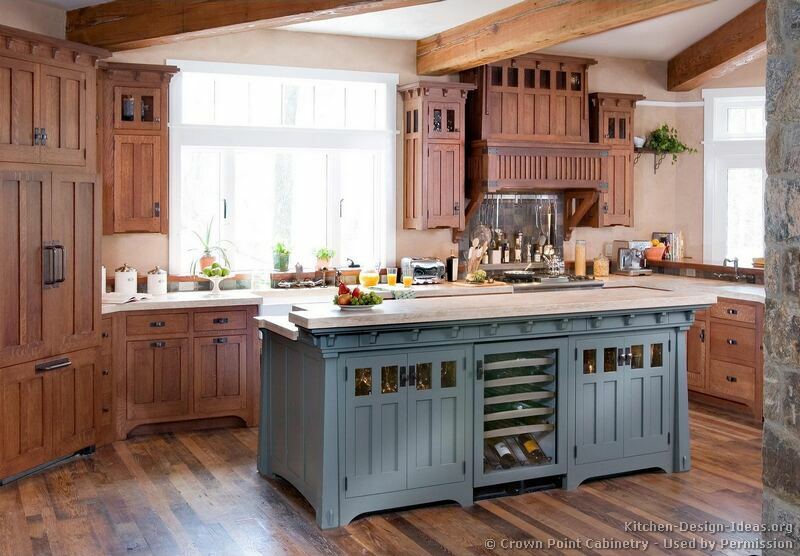 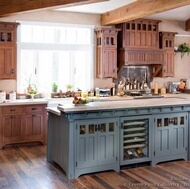 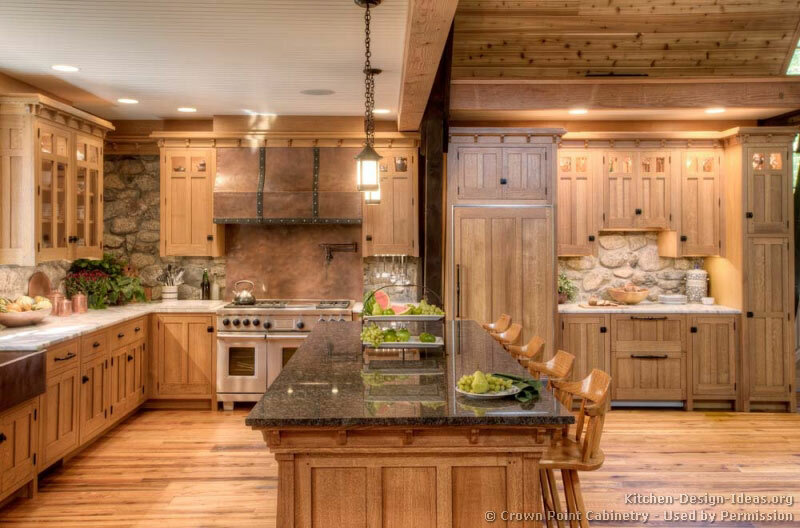 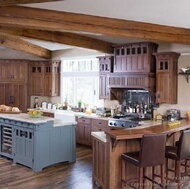 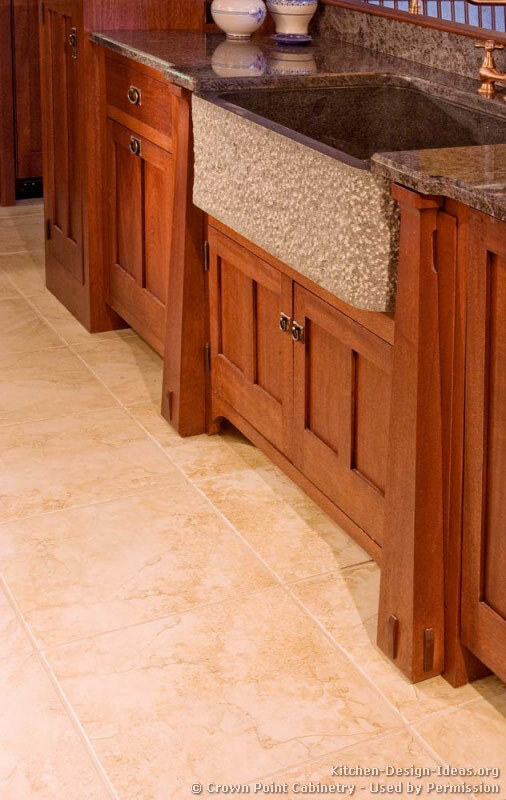 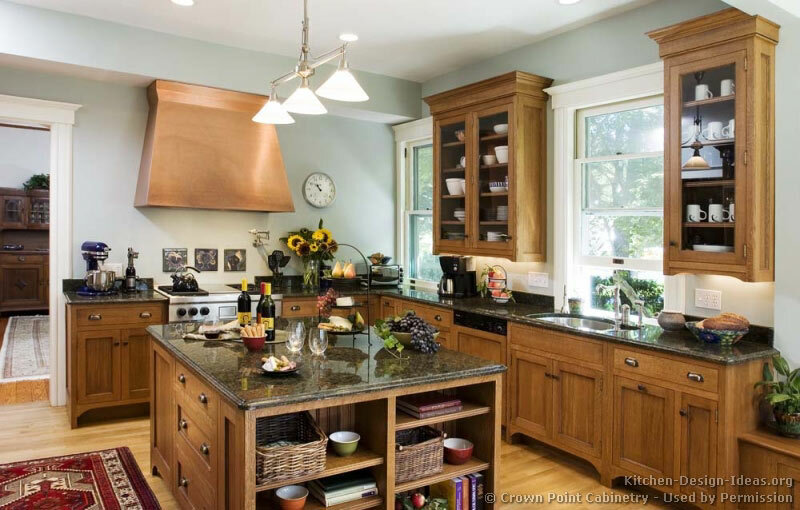 Focus on Quality: Craftsman style kitchen cabinets, built properly, feature dovetailed drawer boxes, mortise and tenon joinery, and rugged hand-crafted construction. 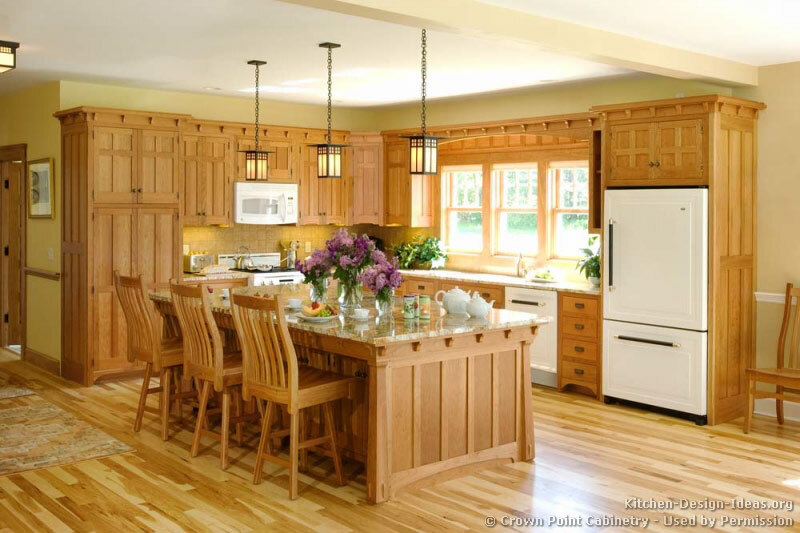 The ultimate Craftsman kitchen contains functional, well-built, and enduring cabinetry, built like an heirloom piece of Stickley furniture. 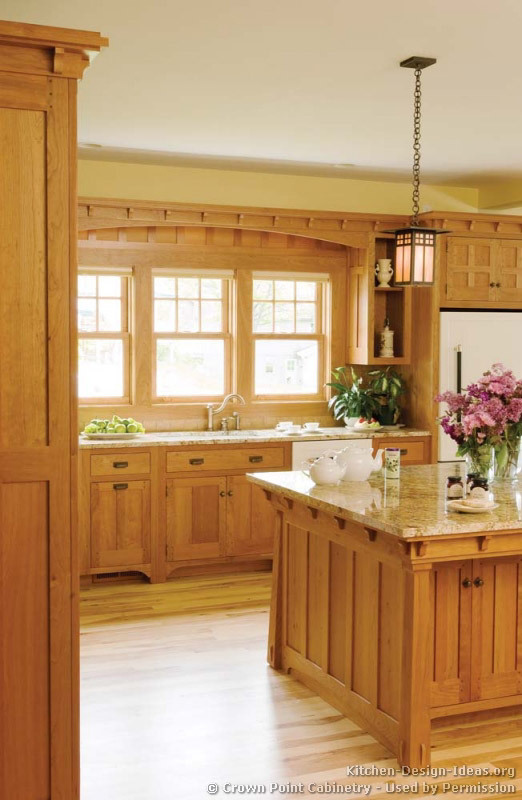 Recent Revivals: When the style fell out of favor by the 1970's, it was all too common for a Stickley piece to be thrown out or sold in a yard sale. 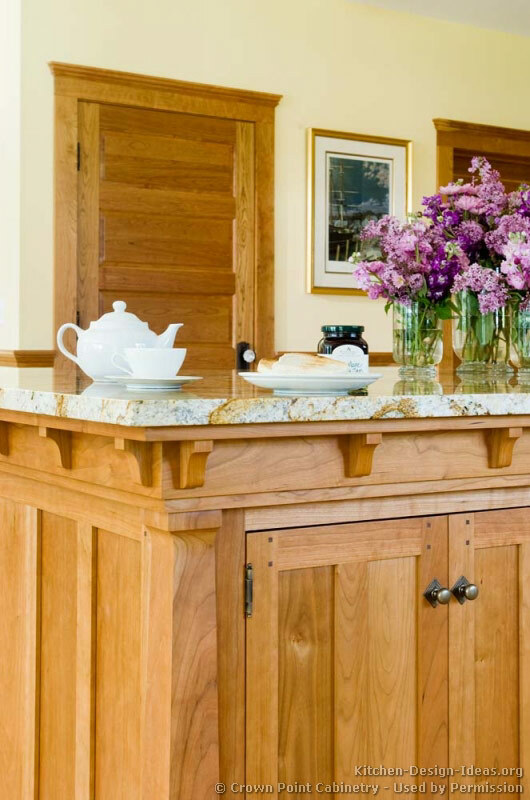 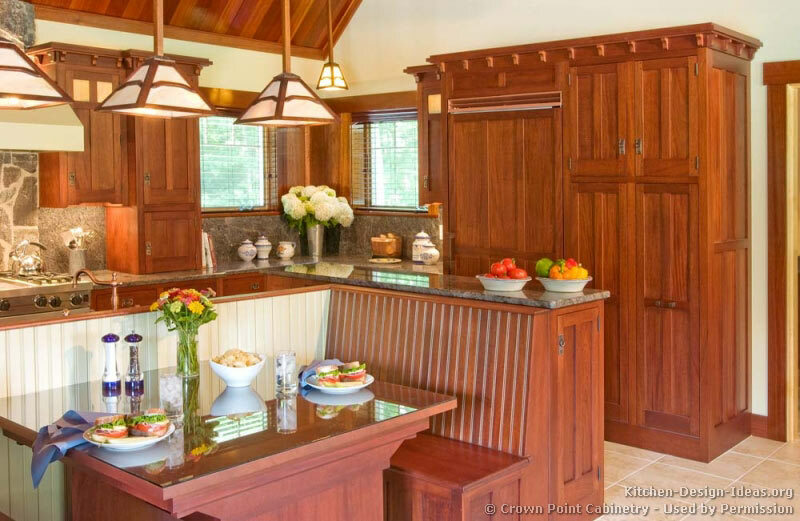 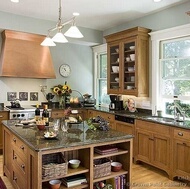 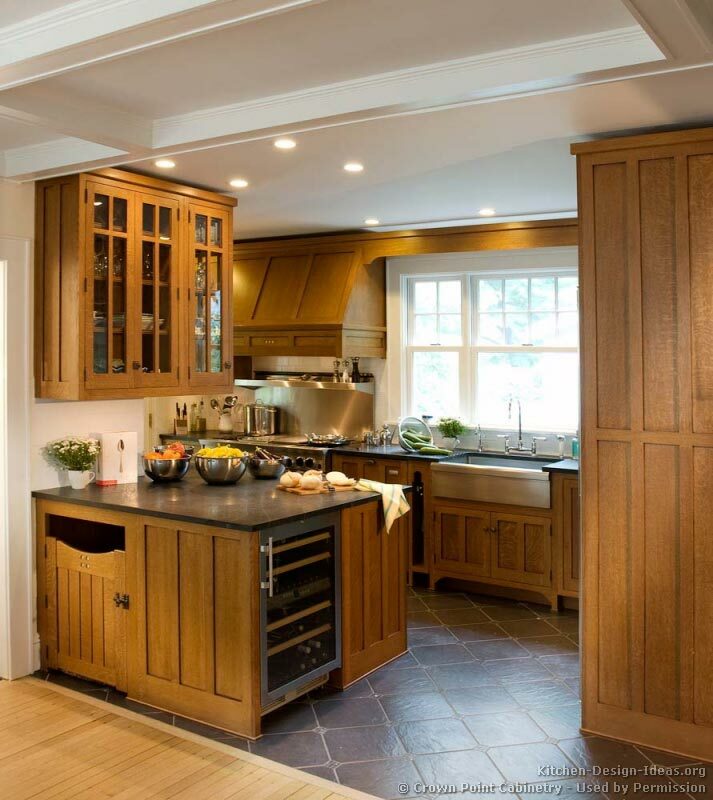 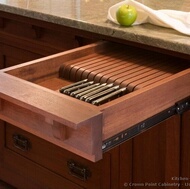 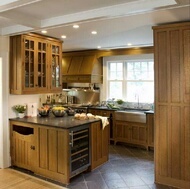 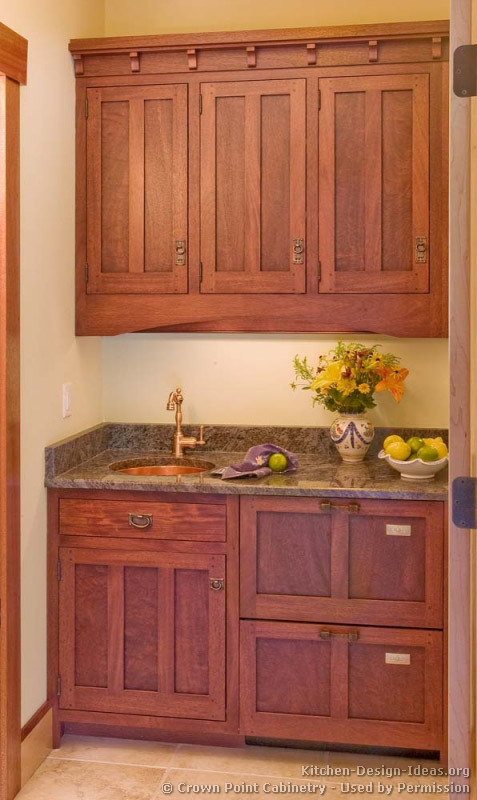 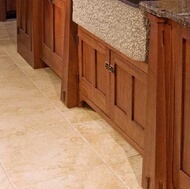 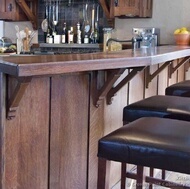 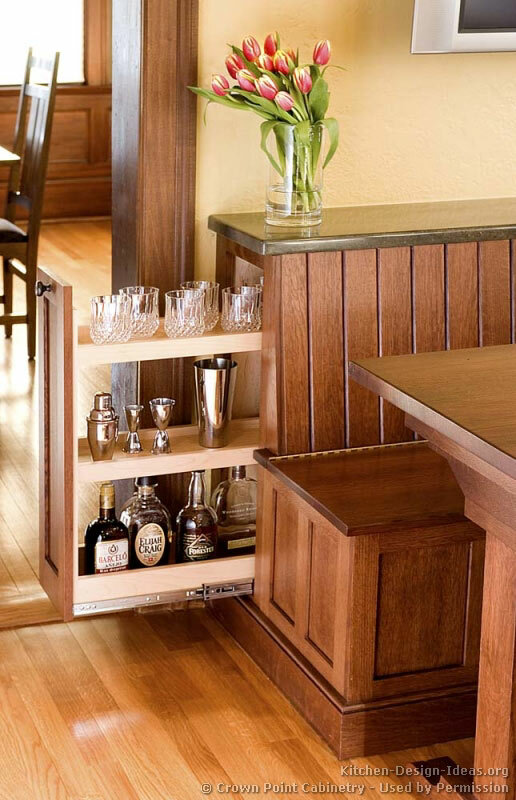 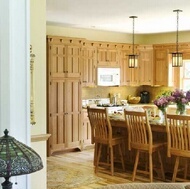 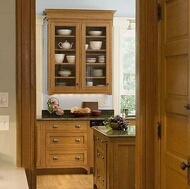 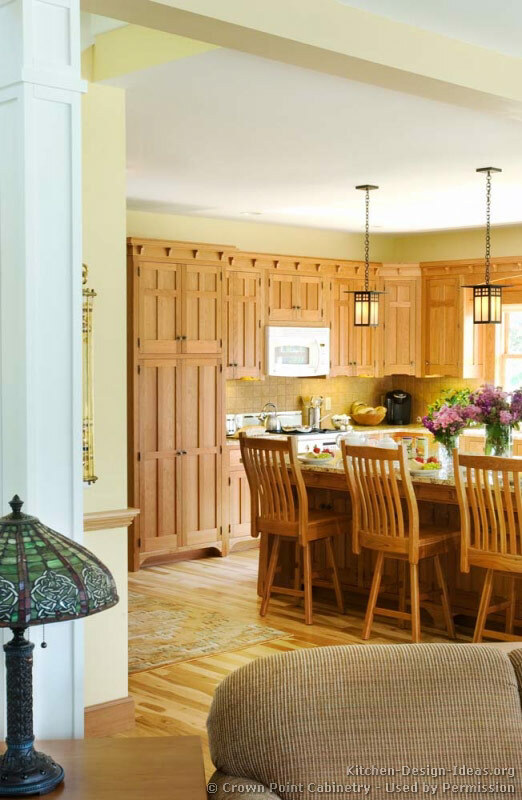 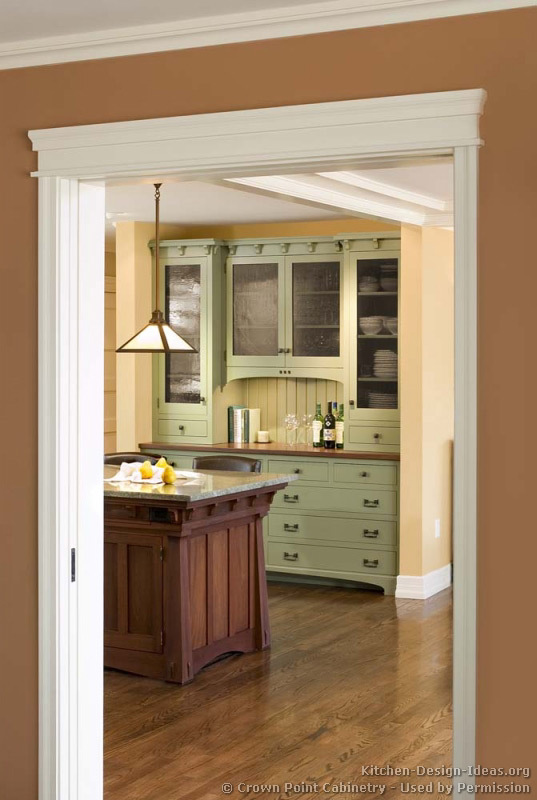 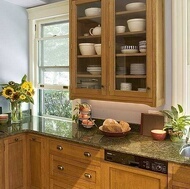 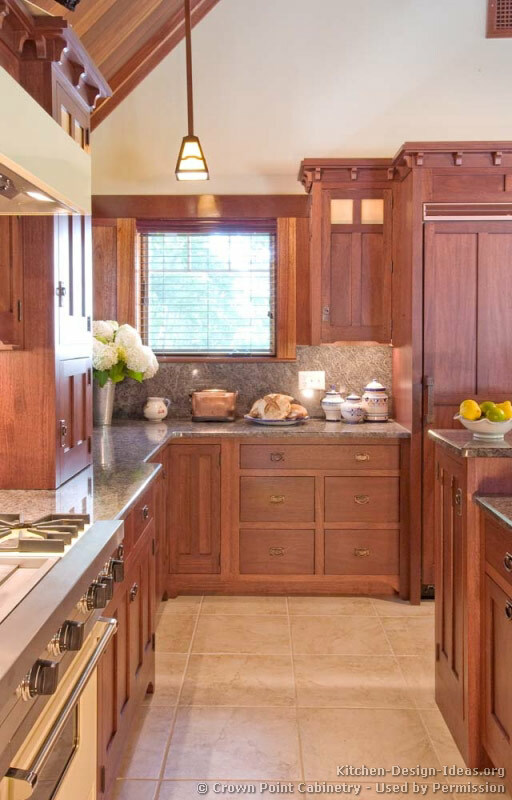 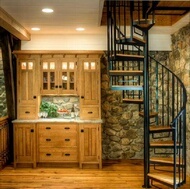 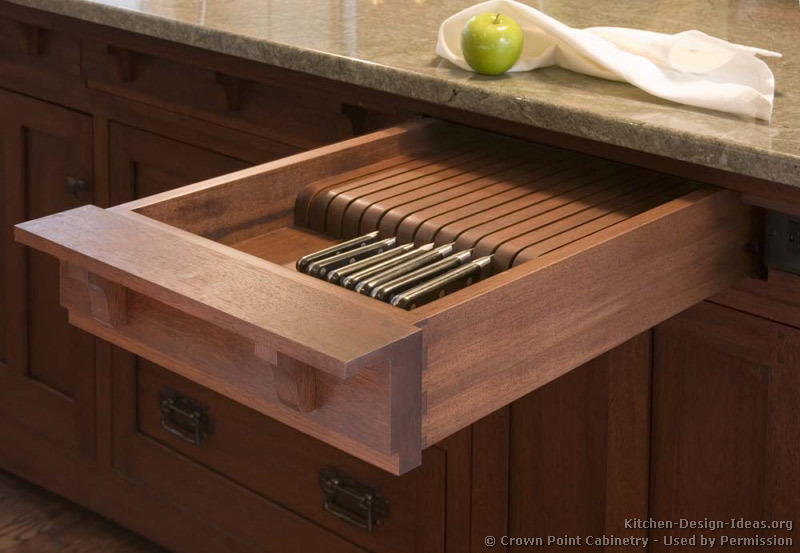 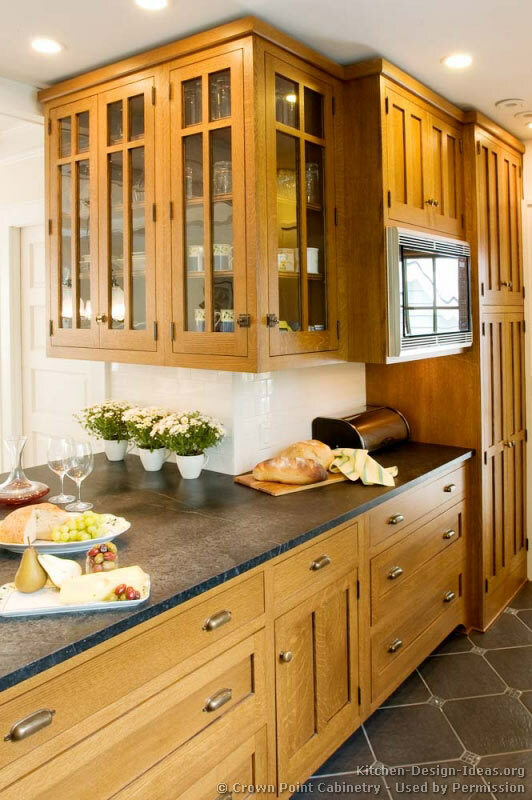 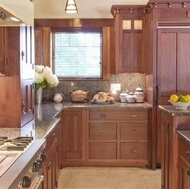 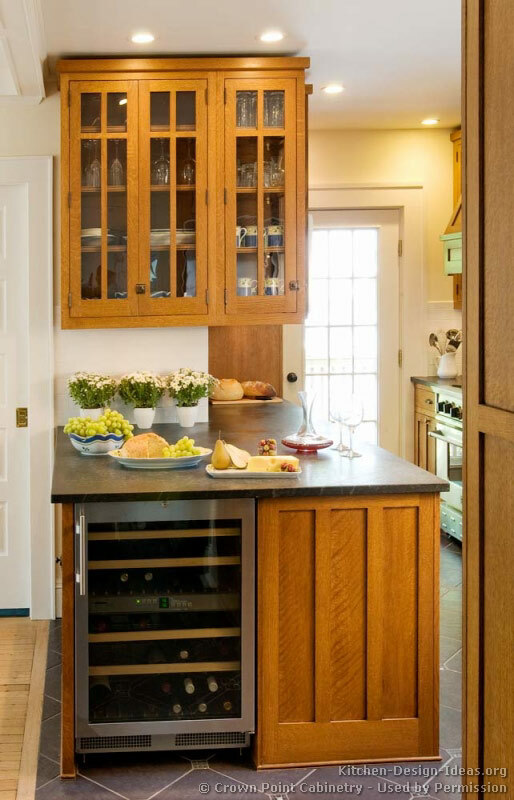 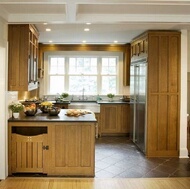 In recent decades, however, with the glut of inexpensive and poorly made imported cabinetry, Craftsman cabinets are enjoying a strong resurgence with homeowners who recognize the true quality of custom cabinets made by artisans of the trade. 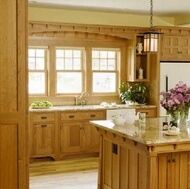 One should expect to pay a premium through custom cabinet makers equipped for the task of building authentic Craftsman cabinetry. 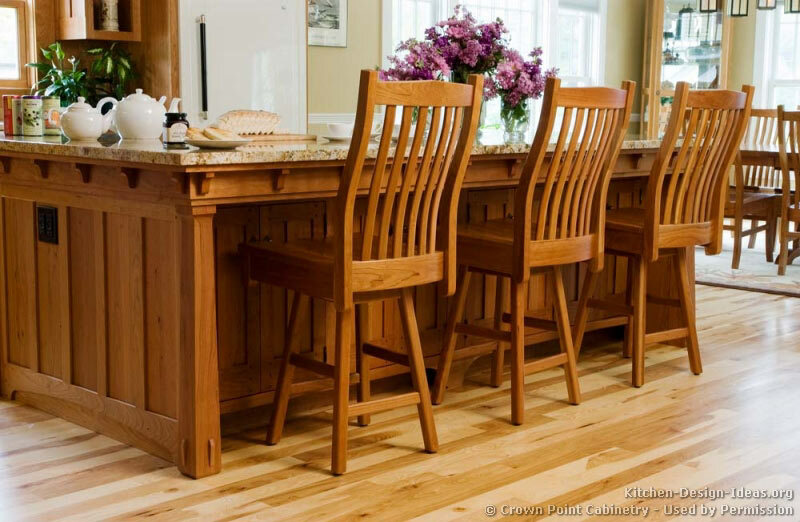 From my own experience in the woodworking and furniture industry, I've come to realize just how true the statement is: "You get what you pay for." 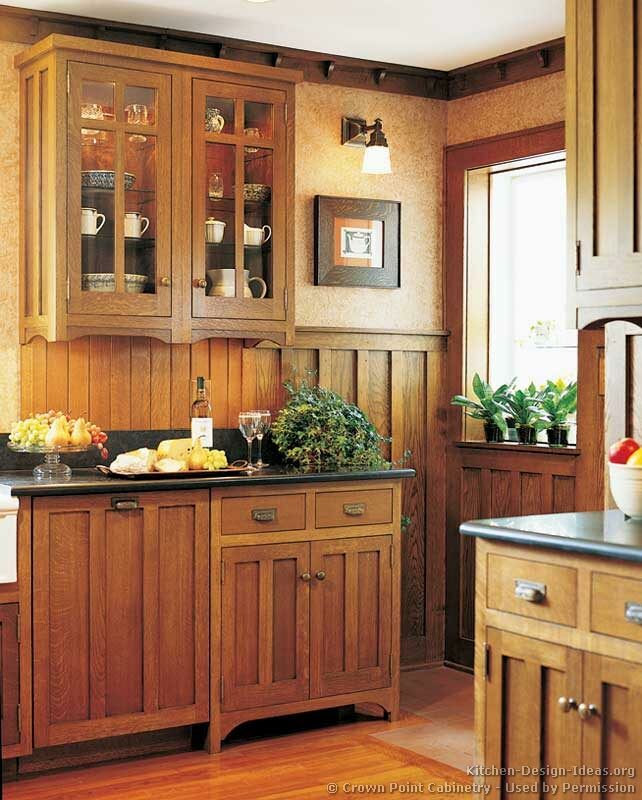 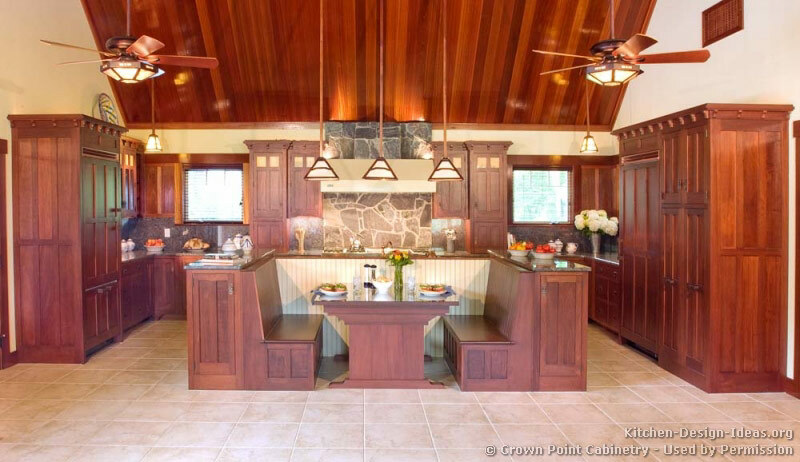 Craftsman Design Photos: Below are some pictures of kitchens featuring Craftsman cabinets. 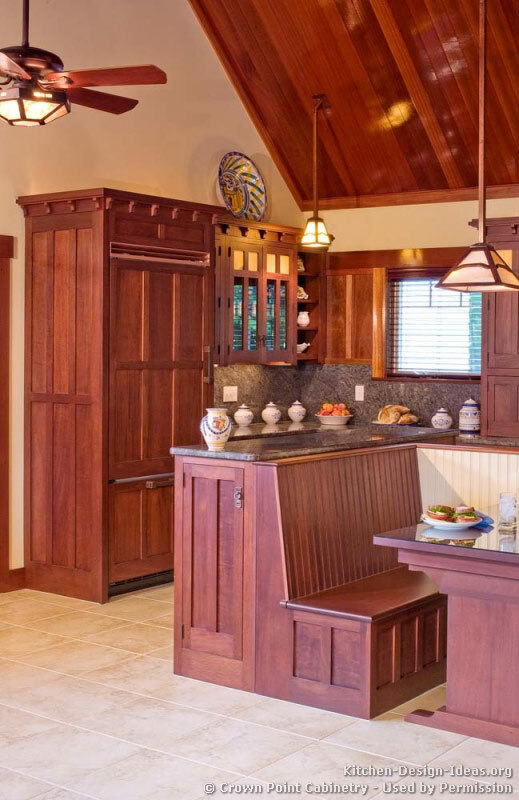 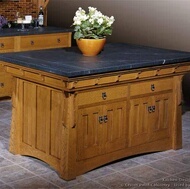 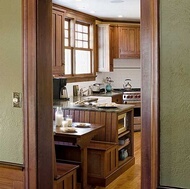 If you enjoy the beauty and simplicity of the Craftsman design, be sure to take a look at the Shaker and Arts & Crafts kitchen galleries as well. 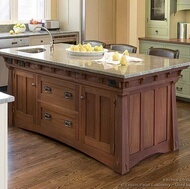 More Kitchen Styles: Return from Craftsman Kitchen to Kitchen Cabinet Styles for more kitchen design ideas and inspiration.